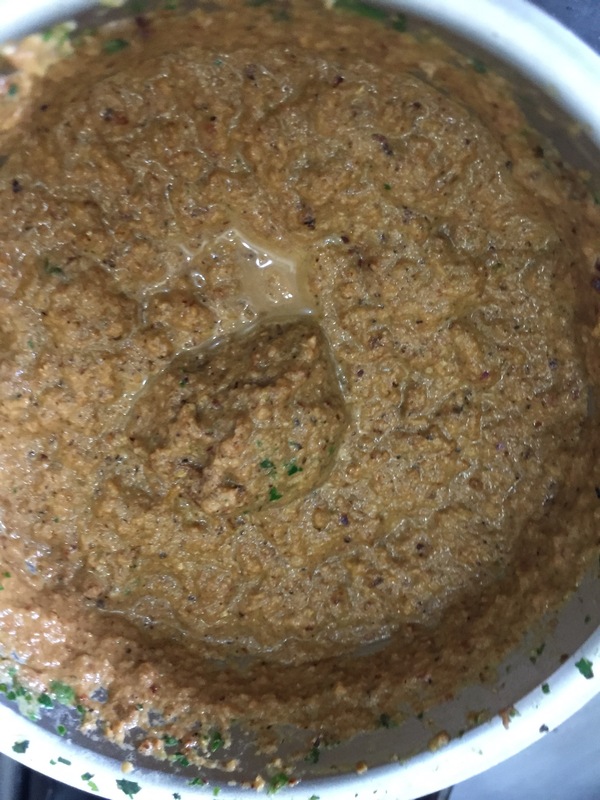 There are many traditional Indian recipes which call for the use of ‘khameer’ – the wild yeast starter used to leaven Indian bread. 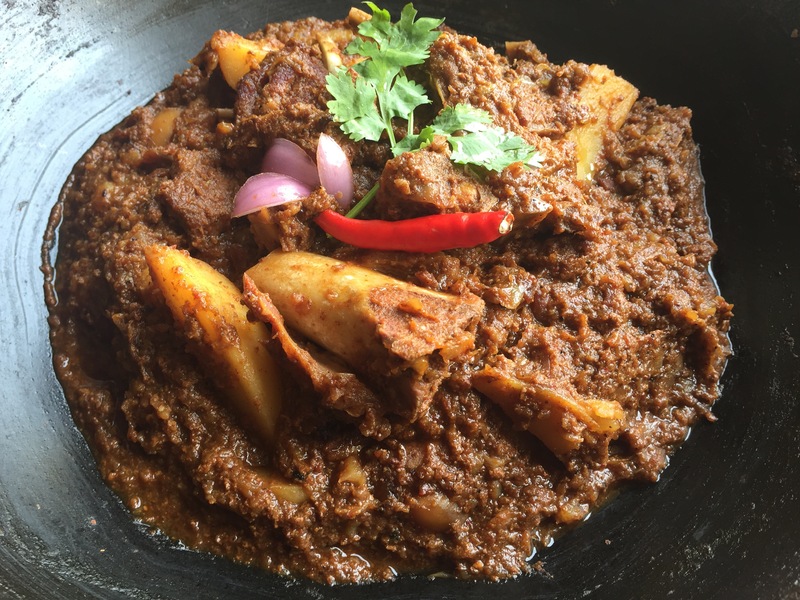 Pathare Prabhus too have a unique wild yeast sourdough summer recipe and the peculiarity of this ‘bread’ is that it’s typically paired with aam-ras! The summer after we got married, my wife and I were invited to a ceremonial dinner at a relative’s residence in South Mumbai. On our arrival I immediately sensed the aroma of the baking sourdough – which my wife attributed to their humid stuffy kitchen and probably some food gone rancid in their bin! Imagine her shock when I revealed that the smell which she found offensive was actually from the prep of an integral part of our dinner that evening! 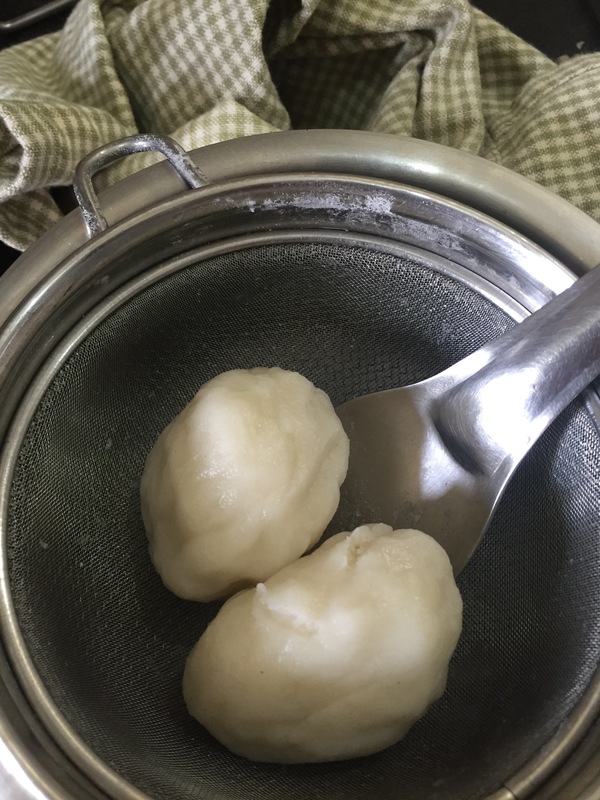 The hot humid Mumbai summer offers near perfect conditions to cultivate this yeast and is equally conducive to the fermentation process so critical to get the right texture of these leavened breads. 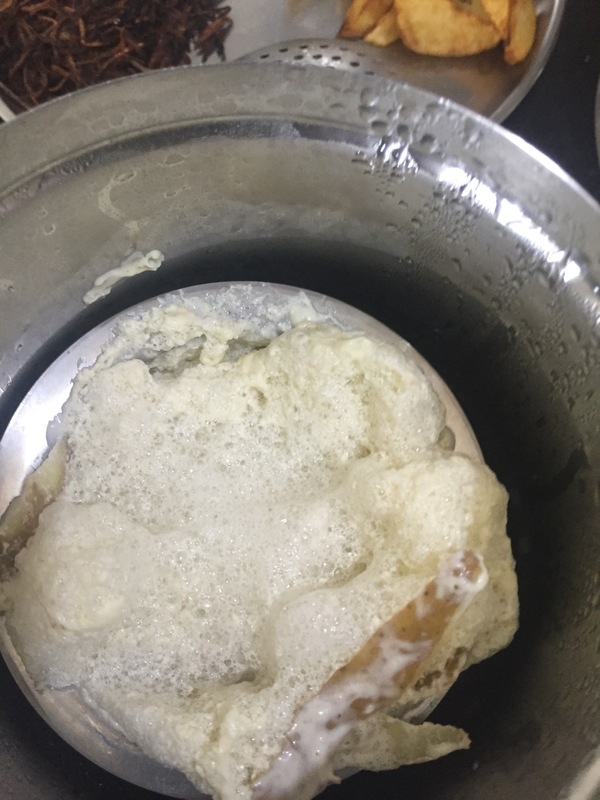 The yeast starter and the resultant product have a unique aroma – unless you’re familiar with the smell, it will certainly strike you as strange and maybe even unpleasant (like overly sour buttermilk or the aroma while making homemade ghee). 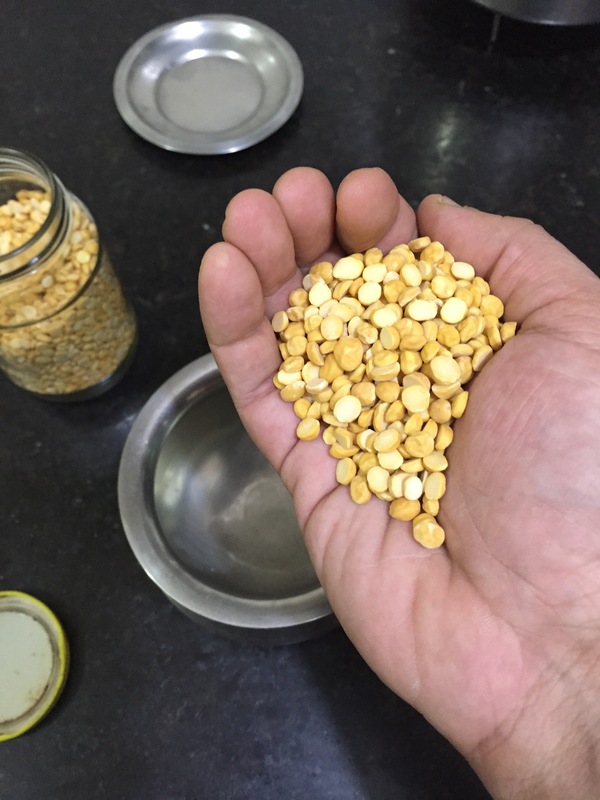 Take 2 fistfuls (½ cup) chana dal in a container with a narrow mouth (कळशी). Add the peel of a potato, a pinch of soda. Put this container into a dabba with a lid that shuts tightly. 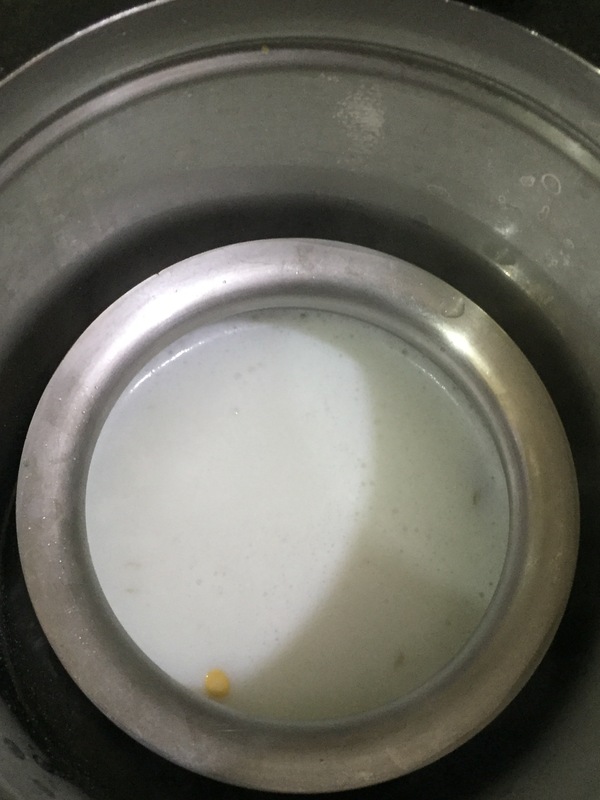 Fill the inner container with a lukewarm mix of milk and water upto it’s neck. 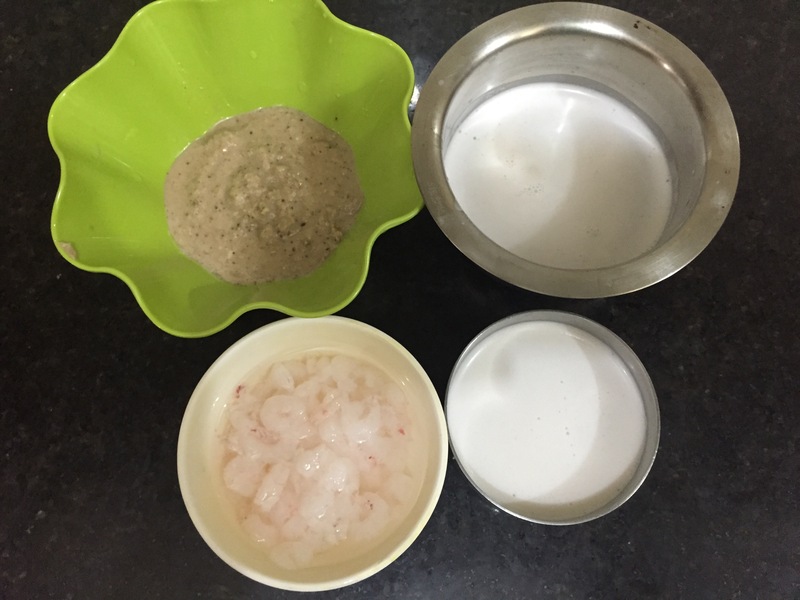 (equal proportions – 1 cup each) Shut the dabba and leave it undisturbed for at least 10-12 hours in a warm place. (Preferably overnight). At the end of this period, the mix will have fermented yielding a sour smelling frothy mix (as seen in the pic below). 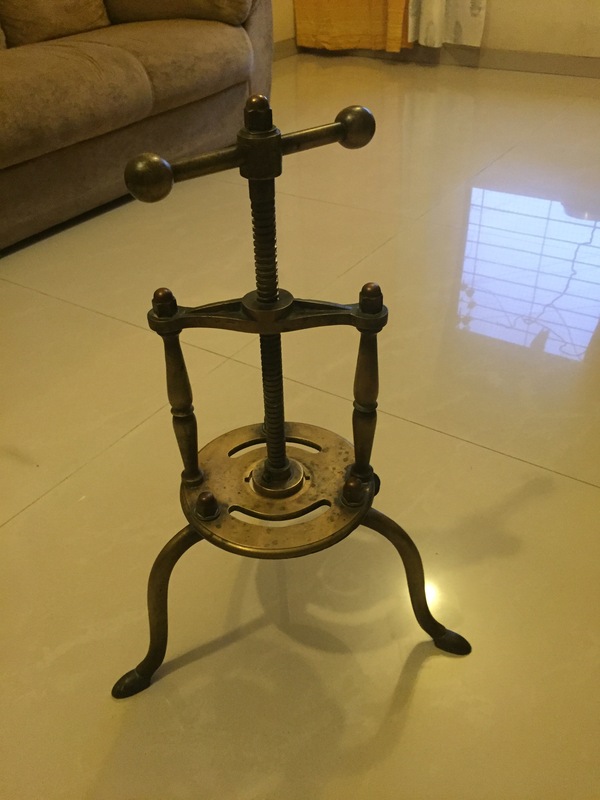 An old PP housewive’s tale narrates how the starter making must be kept completely secret. Legend has it that if your neighbours find out about your plans before the starter is successful, your bread is destined for disaster! 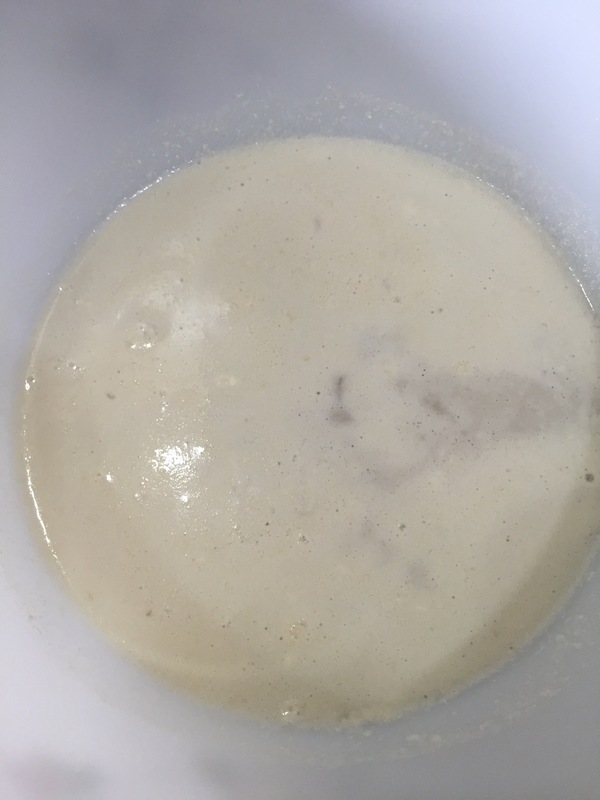 This is what your starter (wild yeast) with which you need to leaven your batter for the ‘Pav’ should look like at the end of the fermentation process. 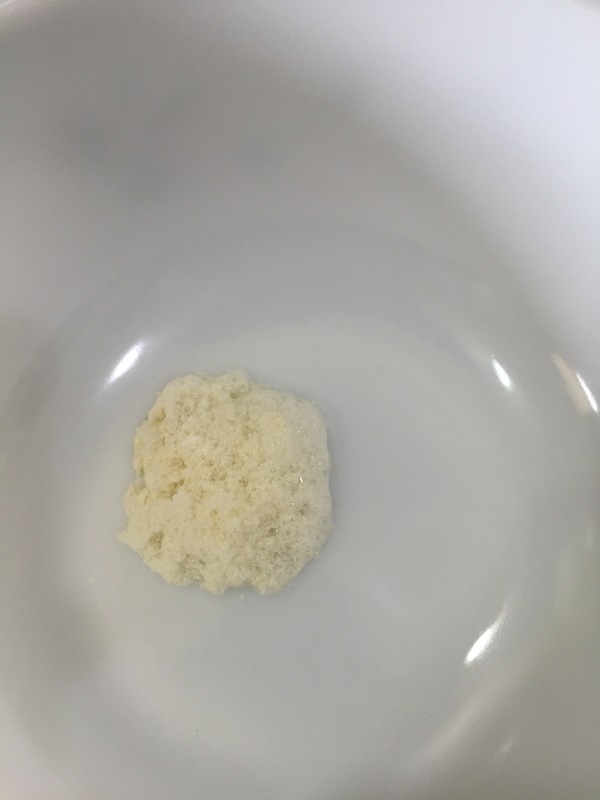 Collect the fermented liquid and the froth on top in a large glass bowl. 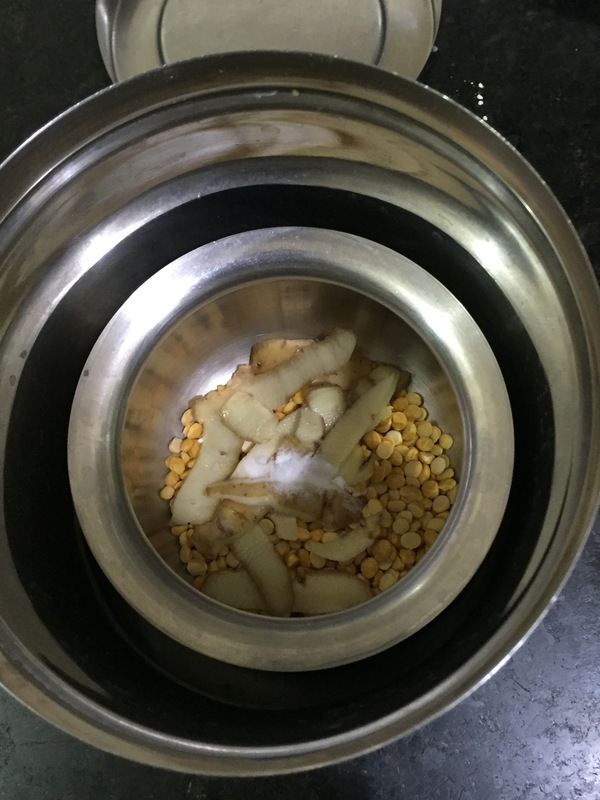 Discard the potato peels and chana dal. 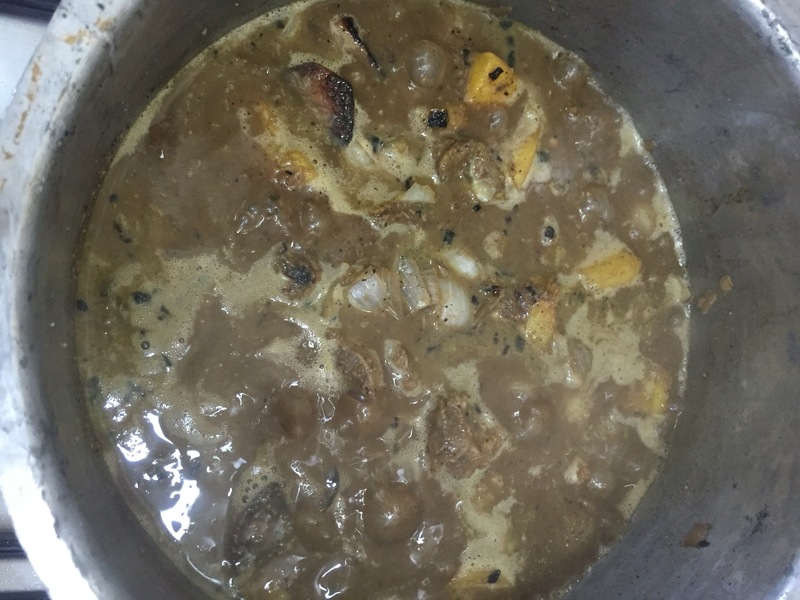 Ensure that not a single peel or grain of dal gets into your batter – I’ve been told that it can cause the resultant product to taste bitter – have never tried doing it, hence can’t vouch for this fact. 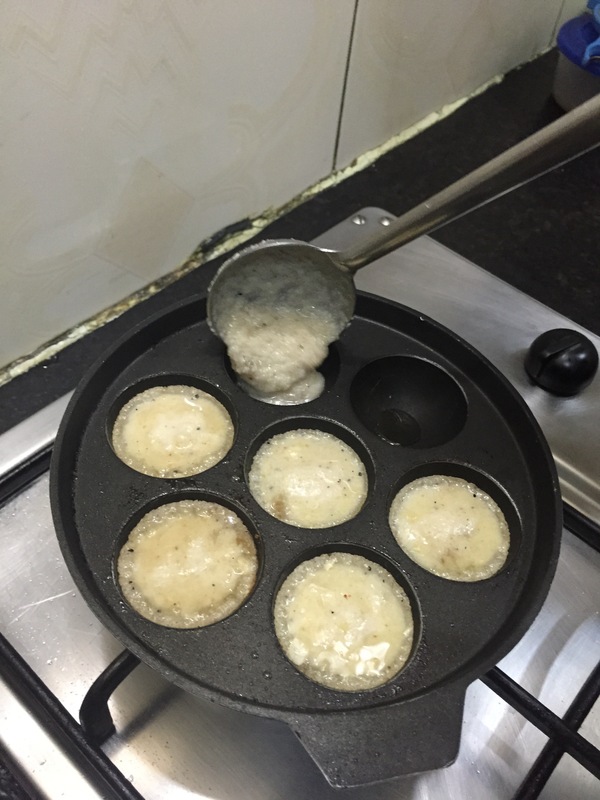 Into the fermented liquid (which should be approximately 2 cups), fold in 3 cups of refined flour (maida) and mix till you have a thick batter (slightly thicker than idli batter). 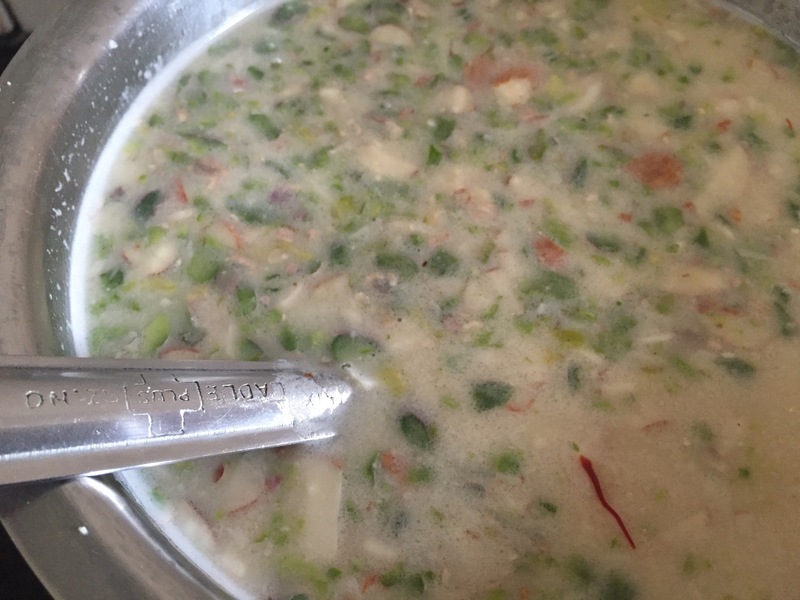 If you think you need a little more liquid to get the right consistency, add some lukewarm water to the chana dal and rinse off – use this to adjust the consistency of batter. 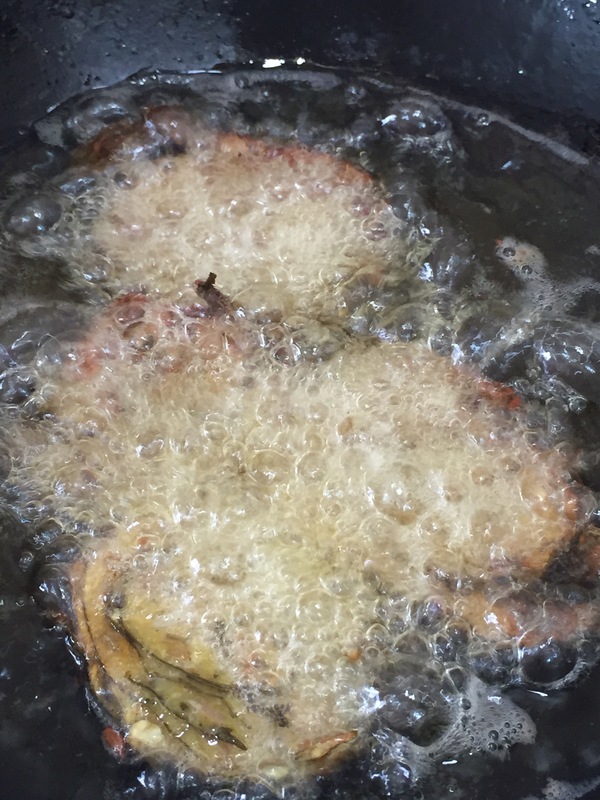 Add a teaspoon of honey, ½ a teaspoon of salt and a quarter cup of melted butter / ghee into the batter. 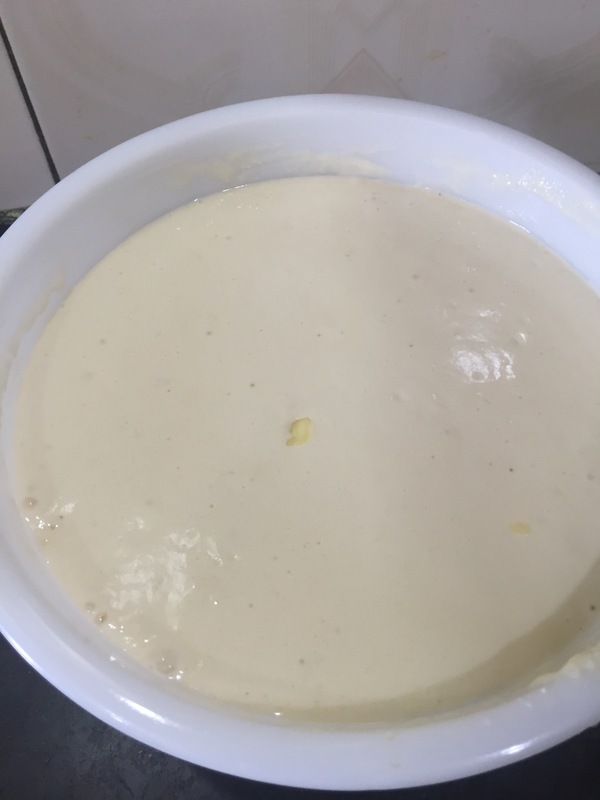 Cover this with a thick cloth / plastic sheet and let the batter rise till its at least tripled in volume. Pour this gently into the moulds which you will use to bake the ‘pav’. 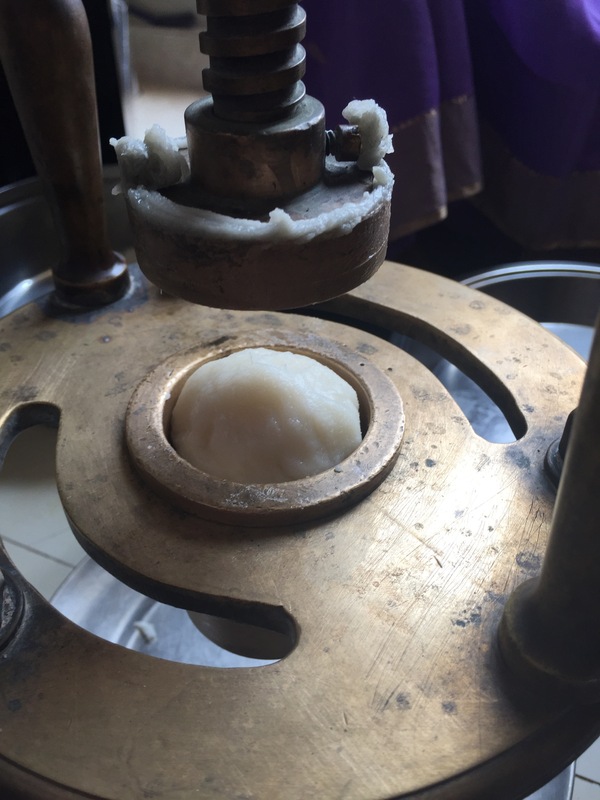 Let these moulds rest for a few minutes. 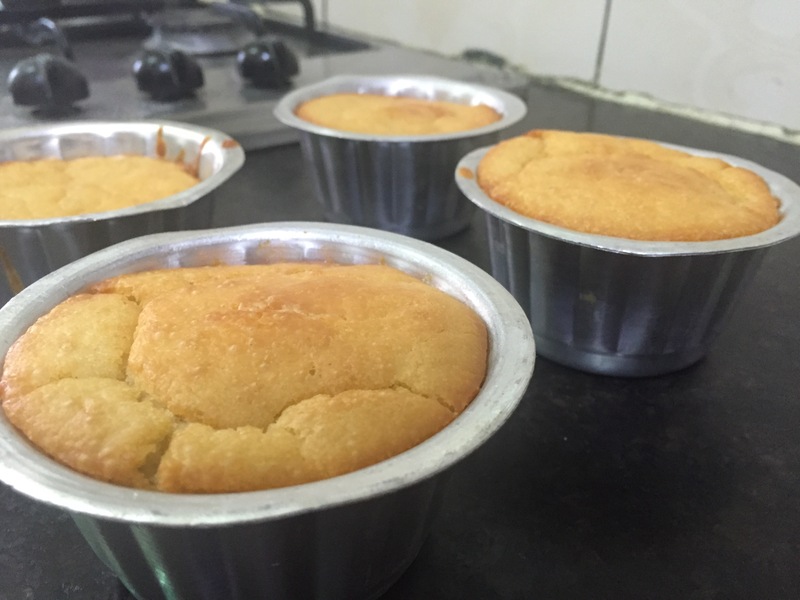 Bake the moulds in a preheated oven at 180 degrees for 20-25 minutes or till the tops turn a lovely golden colour. 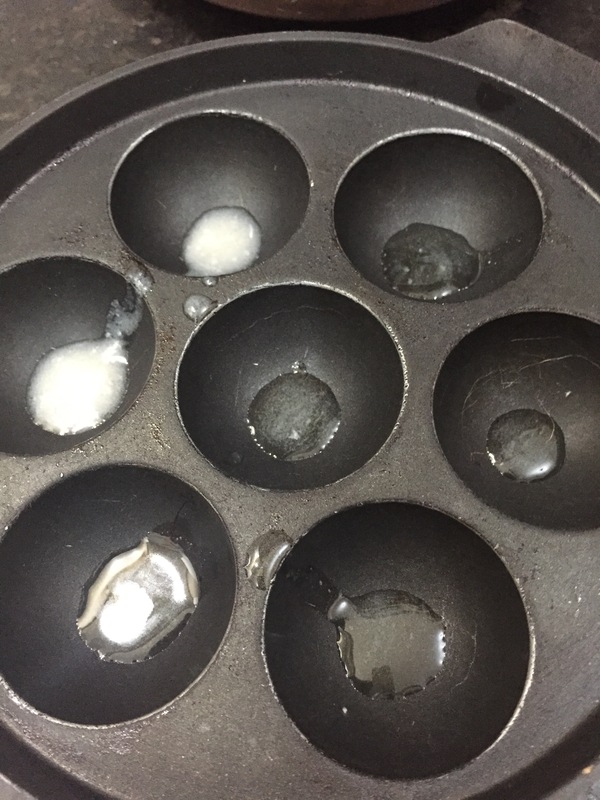 Once they are a lovely golden colour, take the moulds out of the oven and brush the tops with some melted butter. 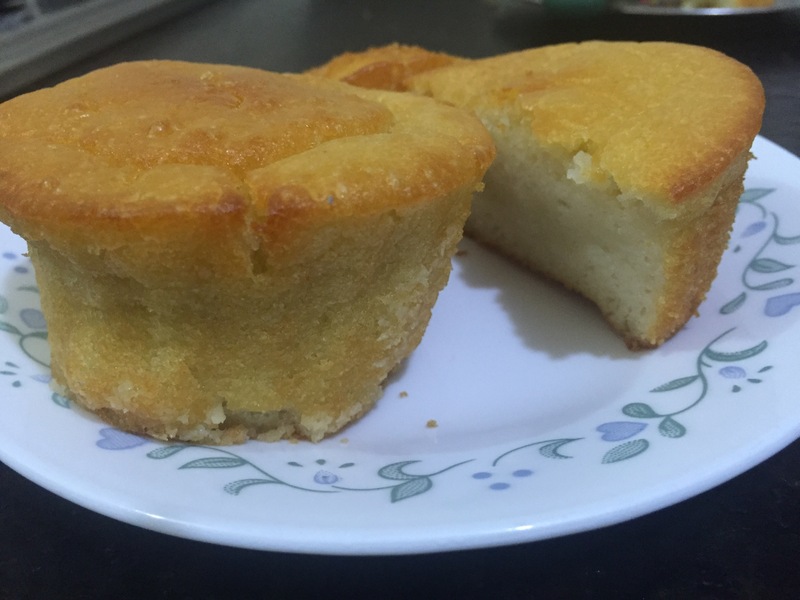 The resultant bread should be airy and resemble the texture of a moist light muffin. 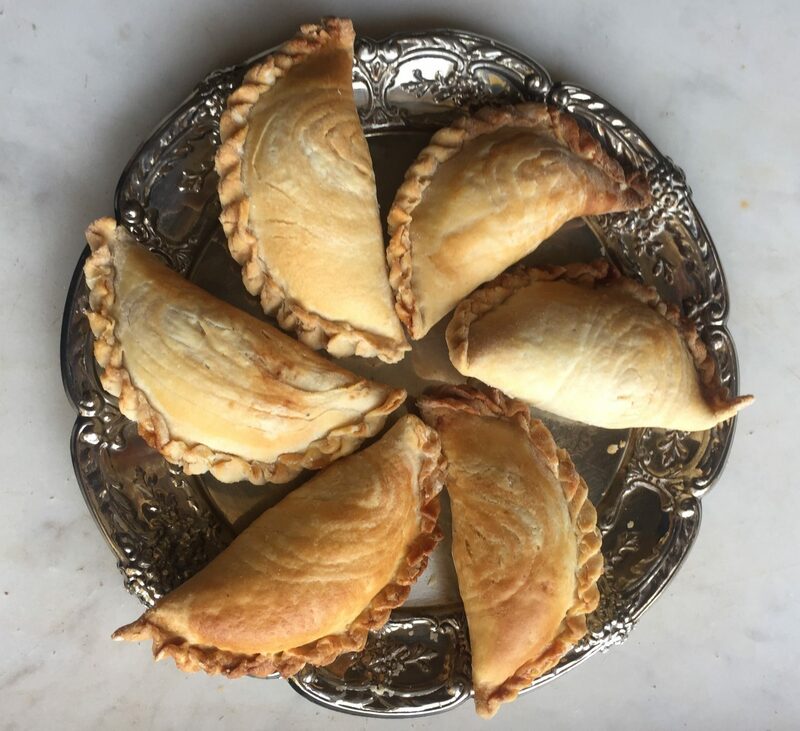 Serve these with aamras and if you think that’s too radical, have them with a hot cup of chai with some butter sprinkled with grain sugar or smeared with some jam. 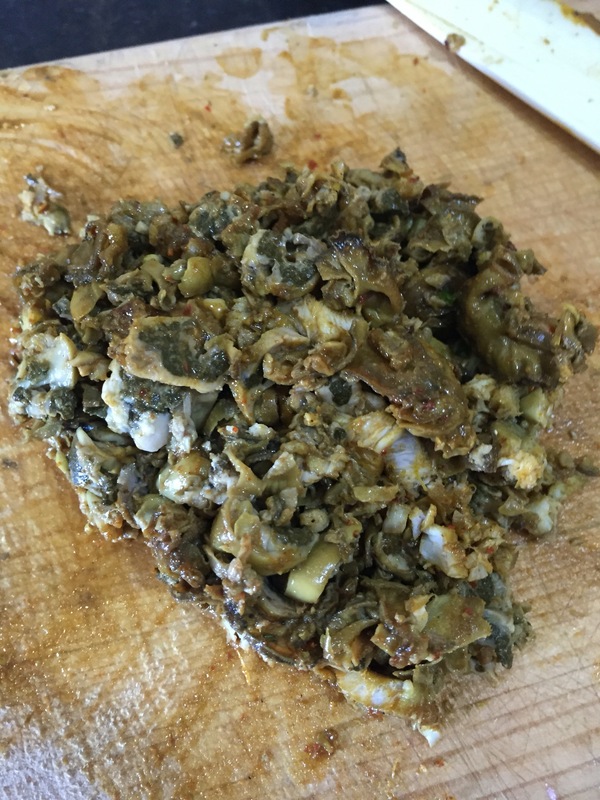 कालवं is the local name for the indigenous oysters. 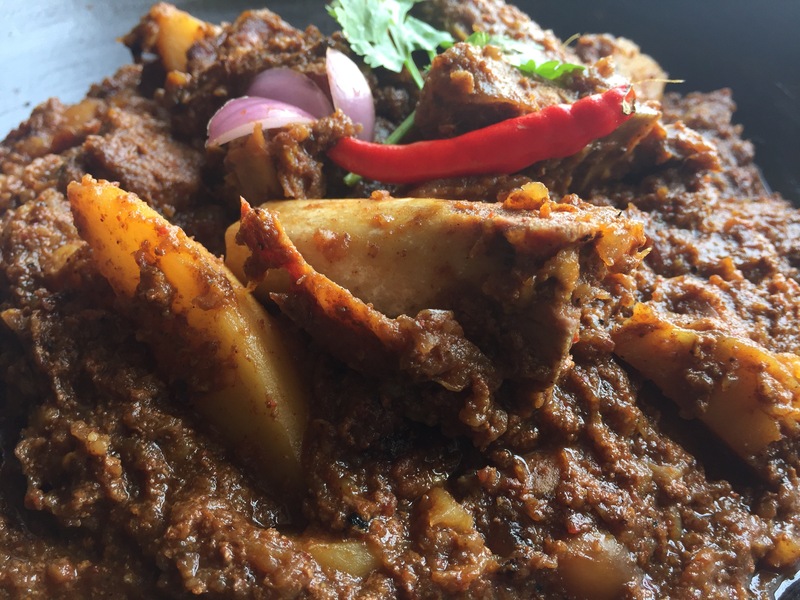 They have a distinct flavour which is quite strong and if you don’t like them at first bite, it’s very rare you’ll ever get used to the taste. They’re usually sold cleaned and de-shelled, but you have to careful wash them to get rid of any residual grit and shell bits. Here’s my adaptation of a recipe shared by a friend. 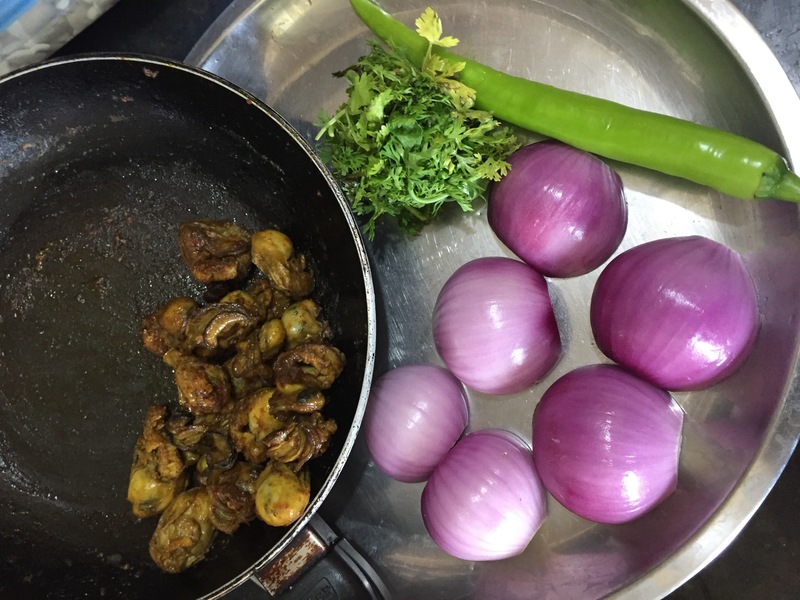 15-20 कालवं – Shelled and cleaned oysters (in a non stick pan, heat a few drops of oil, sauté a tsp of crushed garlic, some haldi, red chilli powder and salt on high heat and add the oysters. 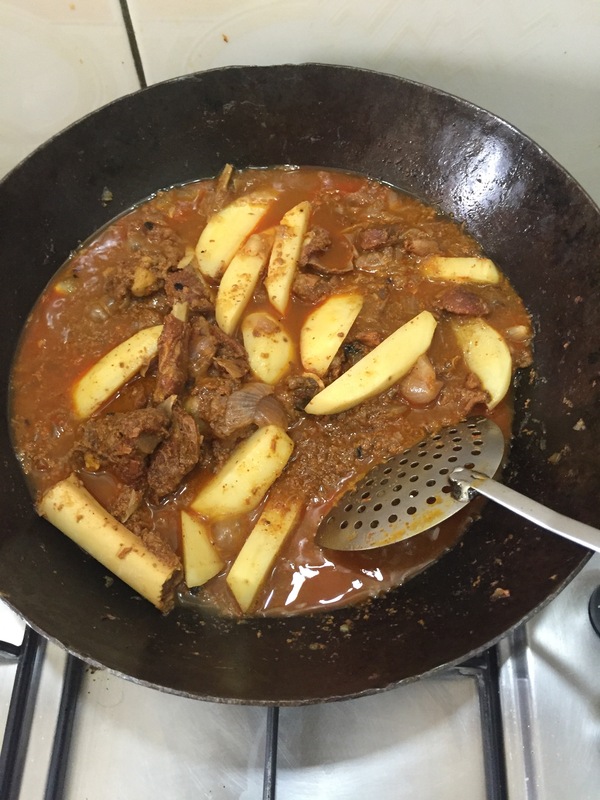 Cook for around 5-7 minutes till done. 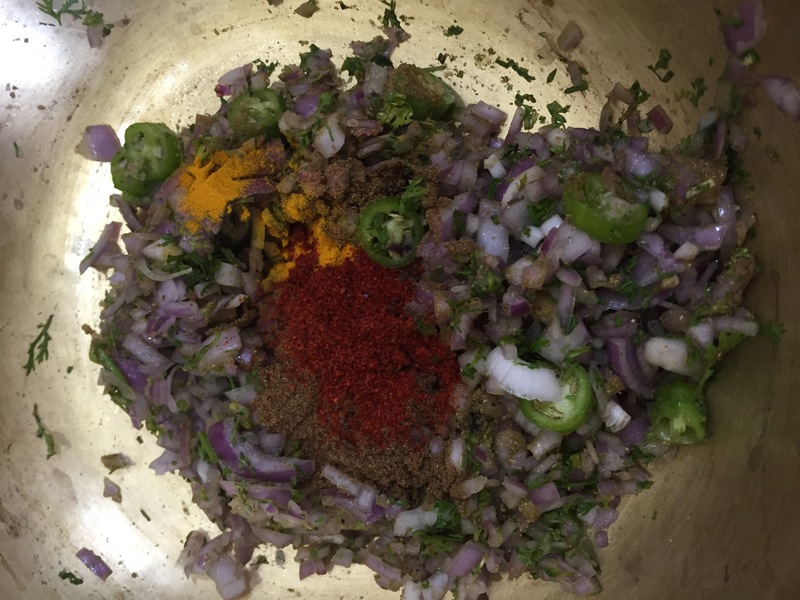 Chop onions and add the masala powders. 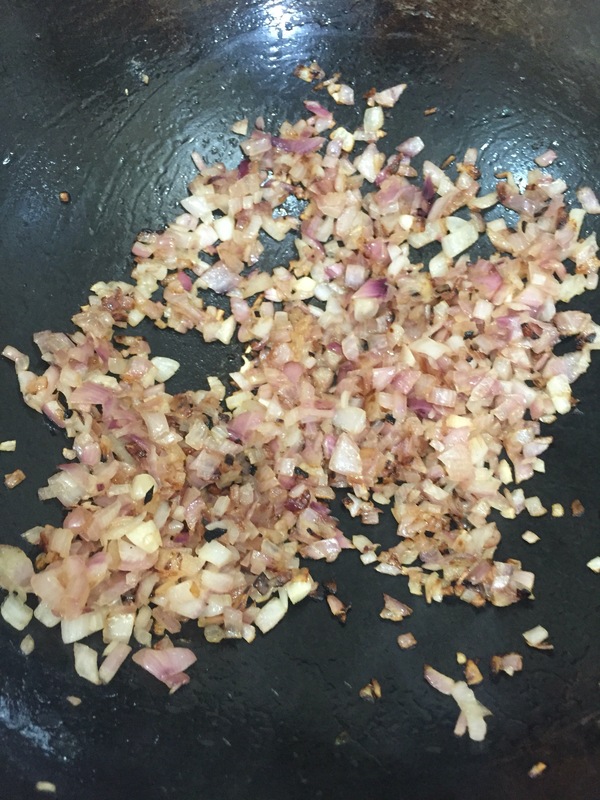 Add salt to taste and set aside till the moisture from the onions has leached. 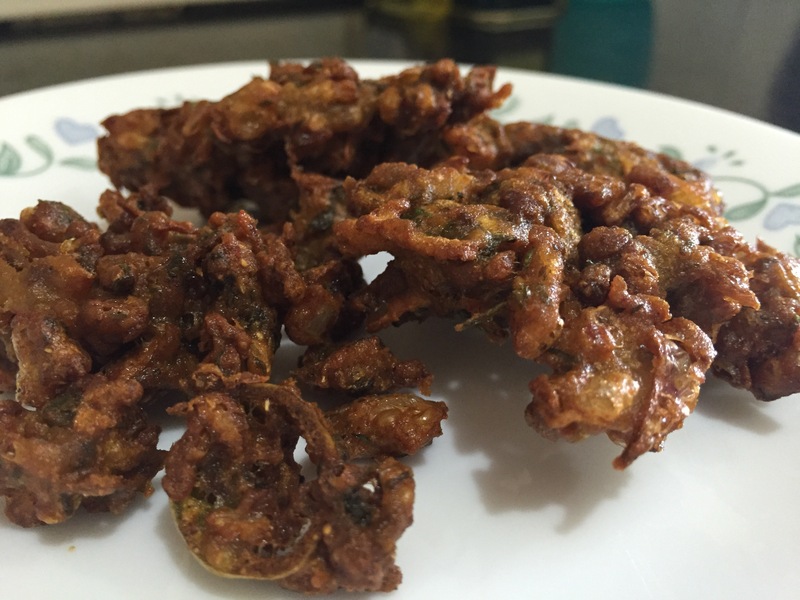 Add besan and rice flour and a tbsp or two of water – just enough to make a bhaji ya like batter. Add the chopped prepared oysters. Let the batter rest for around 20 minutes. 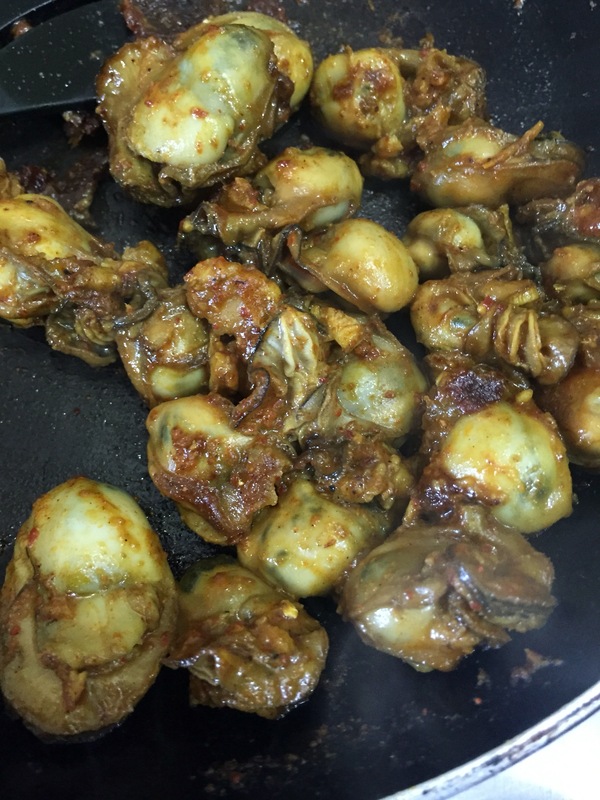 Fry in hot oil till crisp and golden. 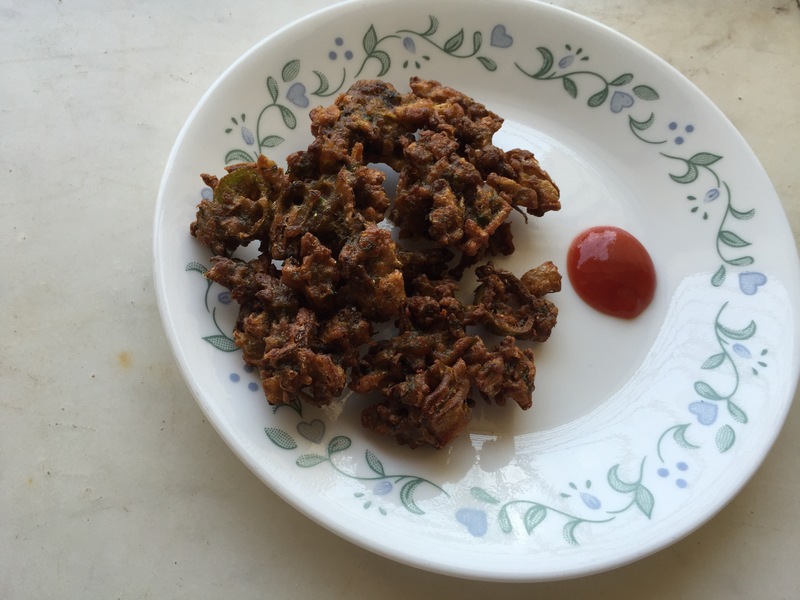 Serve with ketchup or chutney. शेव – दूध! 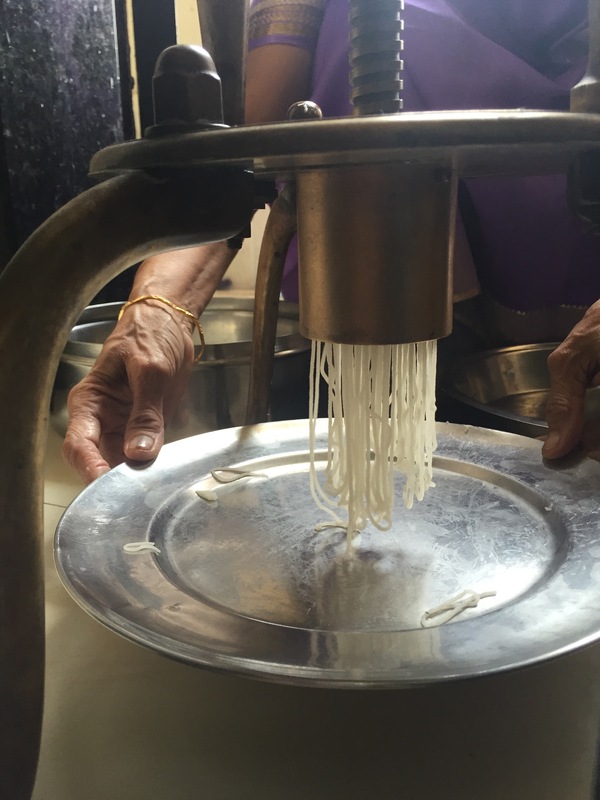 Quintessential Parbhi style Pasta dessert! 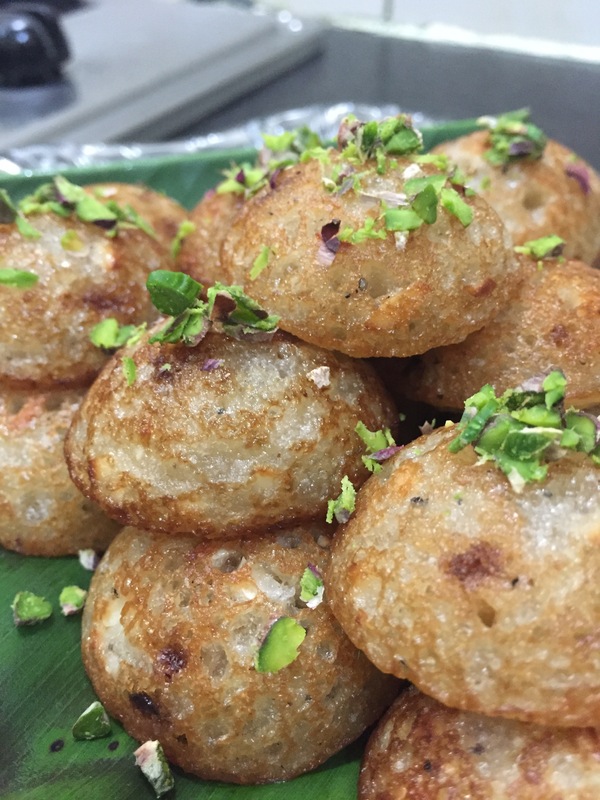 This is served like a dessert… Accompanied with a dipping liquid (sweetened coconut milk aka doodh or shire)! 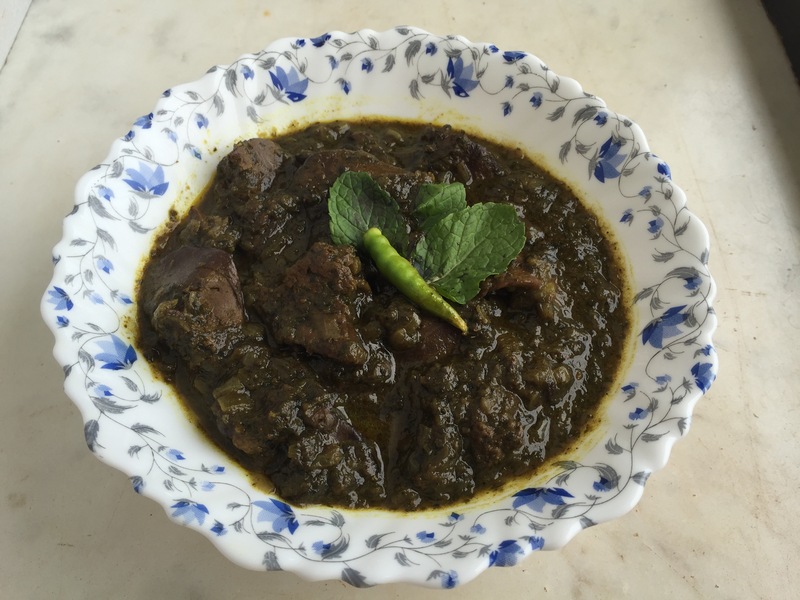 Here goes the ultra simple recipe… Of course this is my version which is a contemporary adaptation of my mom’s age old recipe. 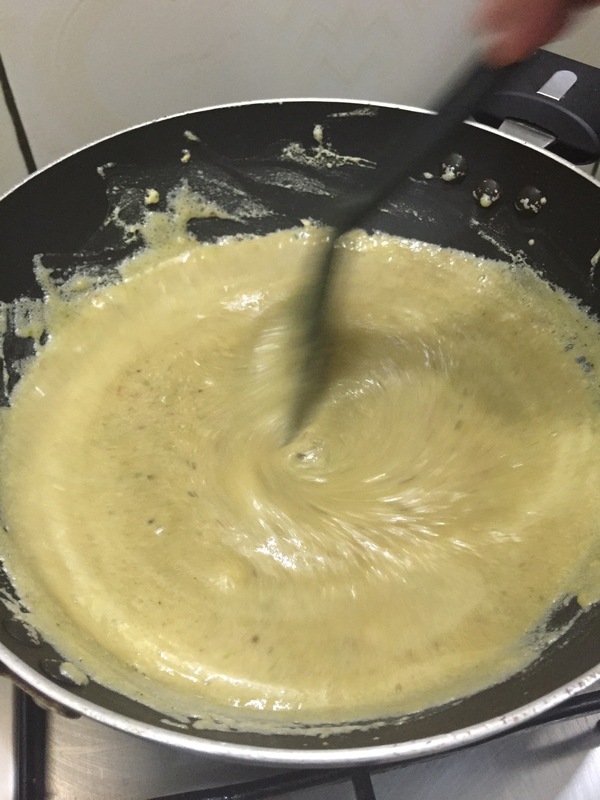 Whisk all the ingredients together till combined and simmer gently till it thickens slightly to a reduced milk like texture. 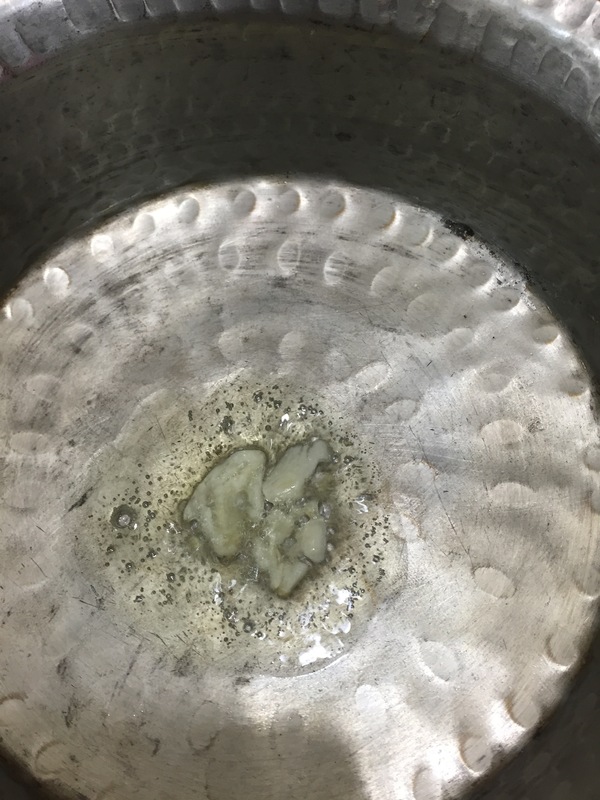 Bring the water to a boil with the salt, sugar and ghee. 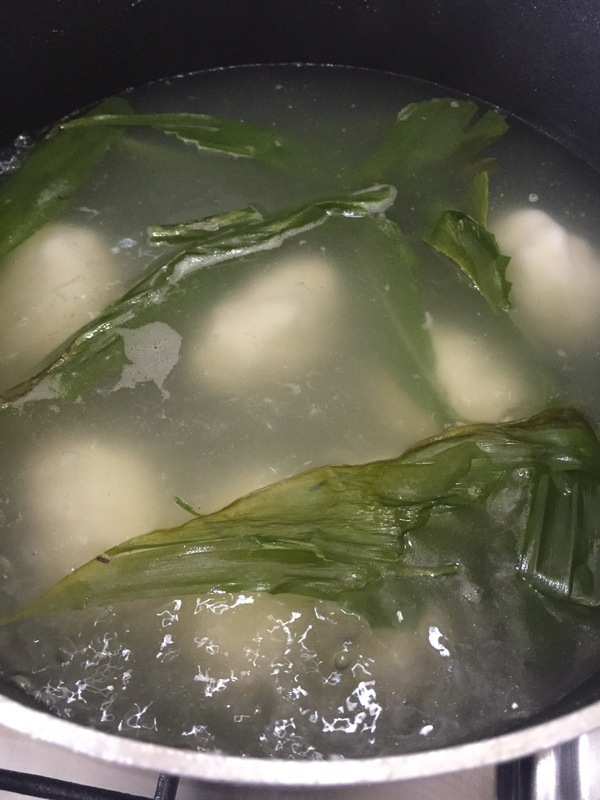 Add the rice flour to the boiling water and quickly mix together. Whisk this together quickly so that there are no lumpy bits left behind. Cover this and cook on a low flame for a couple of minutes. 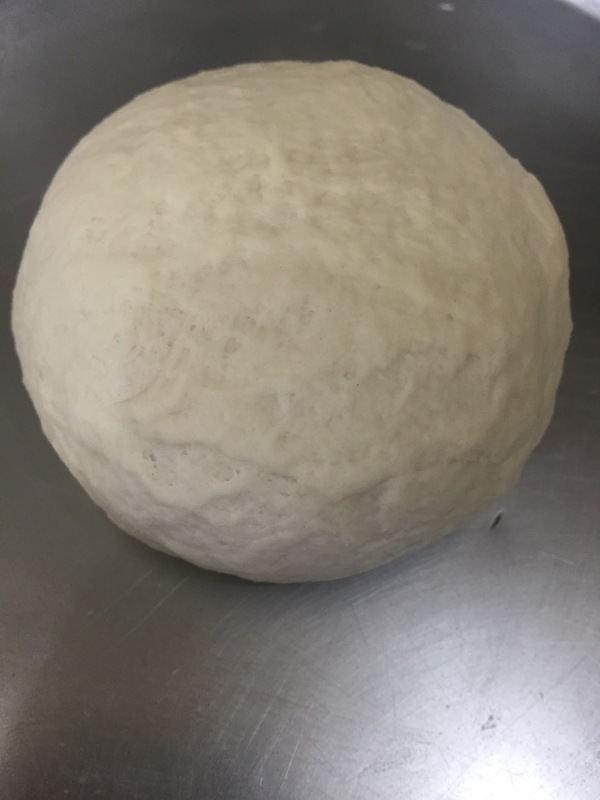 Once it cools slightly, knead well till it comes together to a smooth dough. 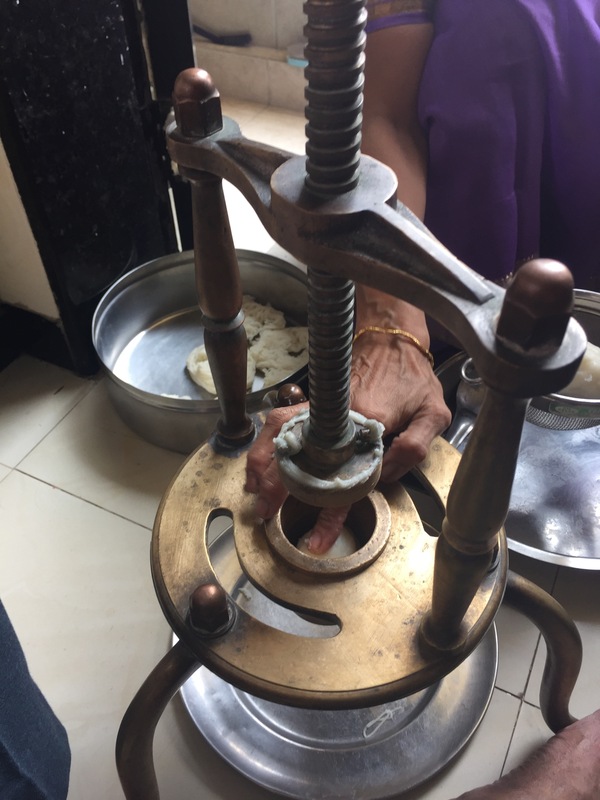 All you gotta do next is mould these to vermicelli… The next few pictures depict how this is done using the ornate antiq shevara! 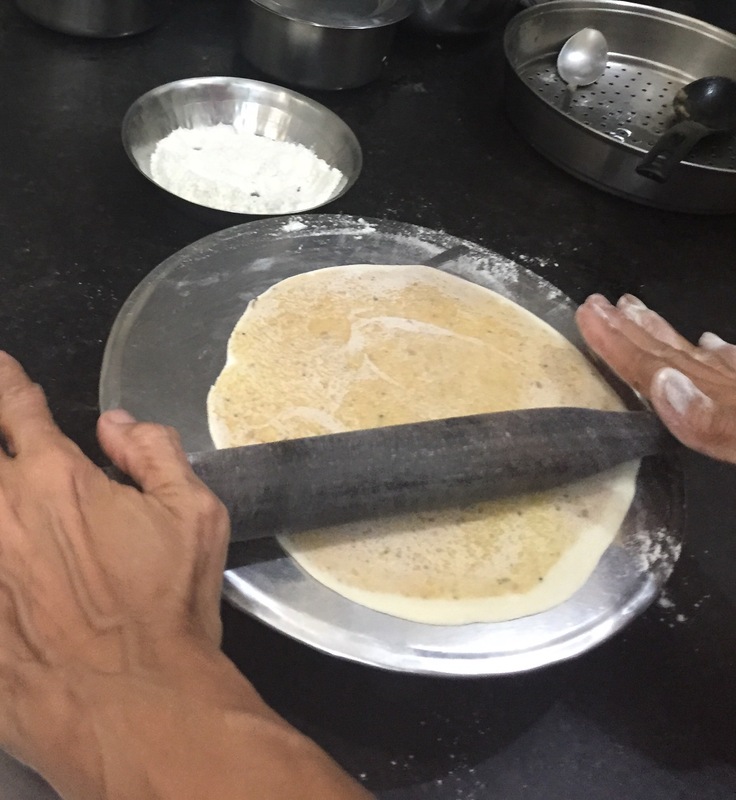 श्रावणी सोमवार special – बदाम पोळी… Crisp Almond Roti! 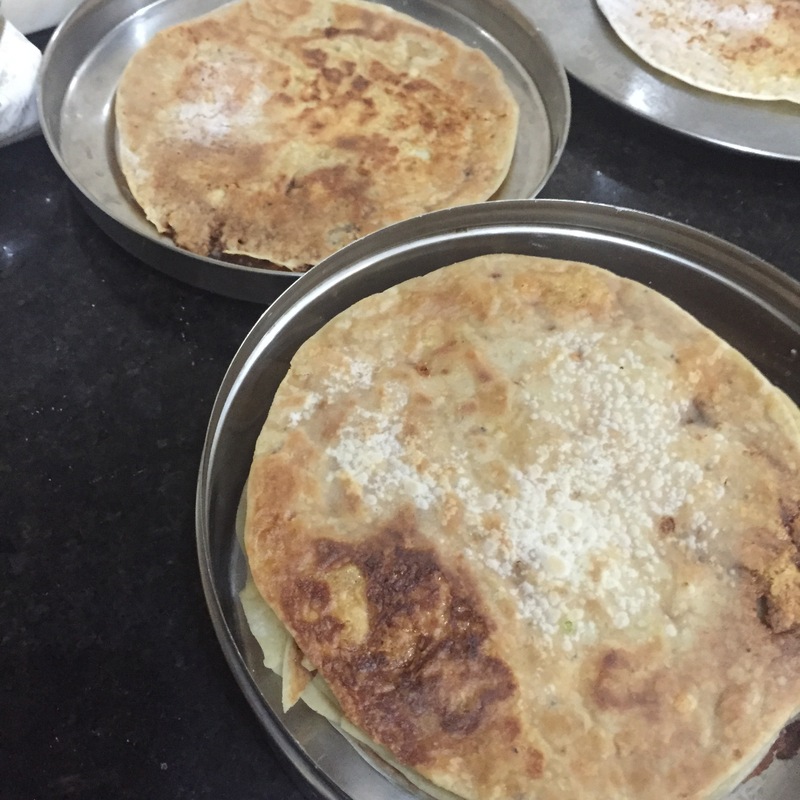 Nothing compares with the Pathare Prabhu community’s obsession with पोळ्या… These are no ordinary rotis… While the rest of the Marathi world is content with Puran Polis and some may make the occasional sanjori, parbhus take this humble Maharashtrian dal stuffing and replace it with assorted goodies – ranging from grated dates, banana halwa (kel poli) to this decadent sinful stuffing of assorted nuts. 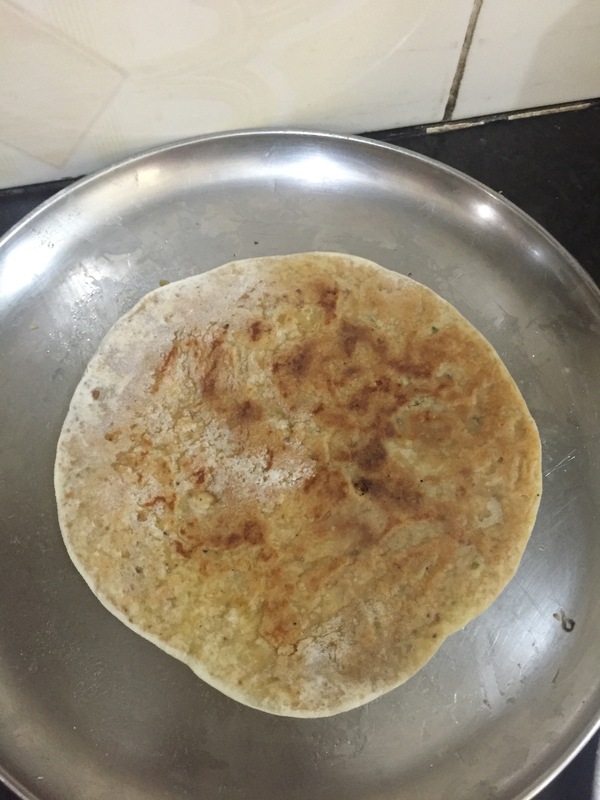 These exquisite crisp rotis with a sweet stuffing are a time consuming, labour intensive affair. 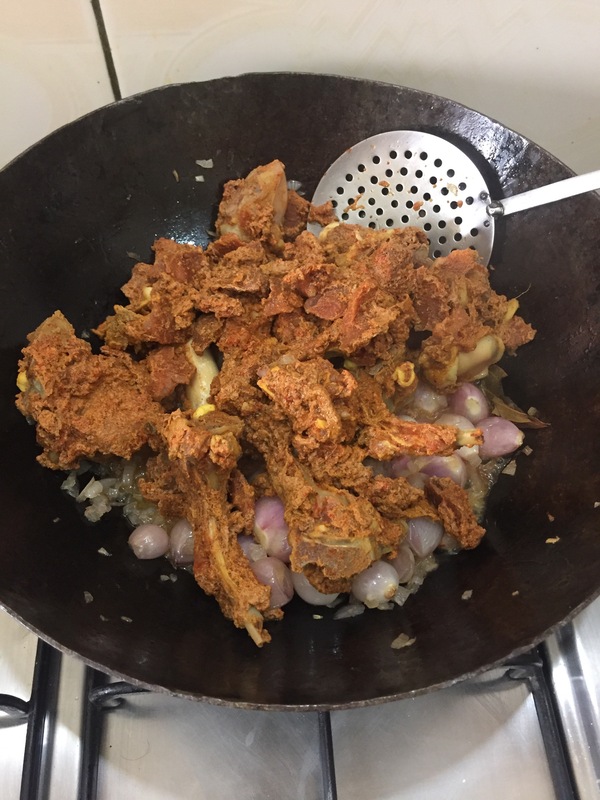 The recipe is long and complicated… Bear with me 🙂 this yields 20 polis. 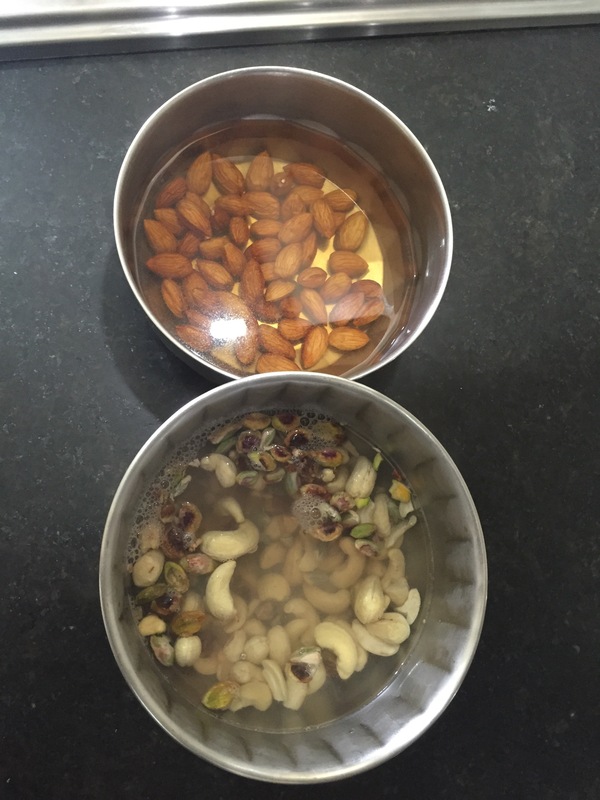 Soak the almonds, cashews and pistachios in a cup each of warm water for 20-30 minutes. Peel the almonds and any traces of peel on the pistachios. Drain off all the water. 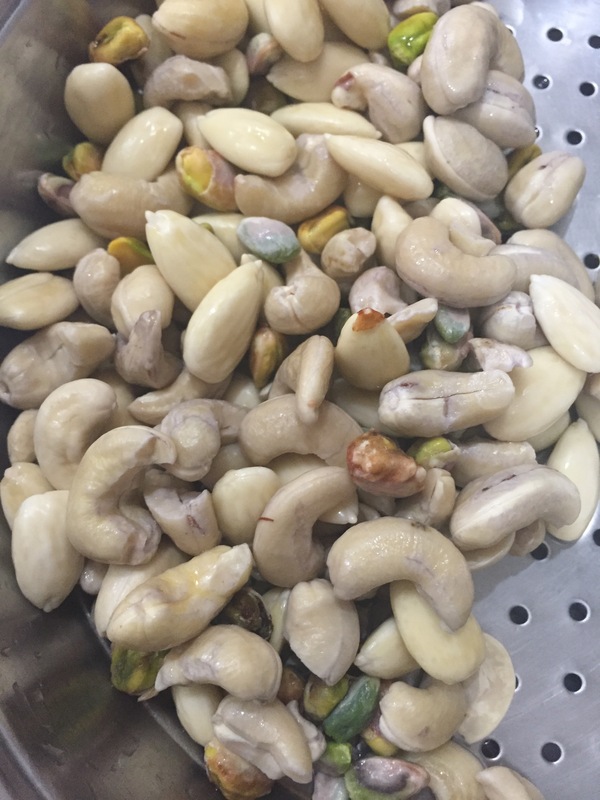 Grind these soaked nuts to a smooth paste. 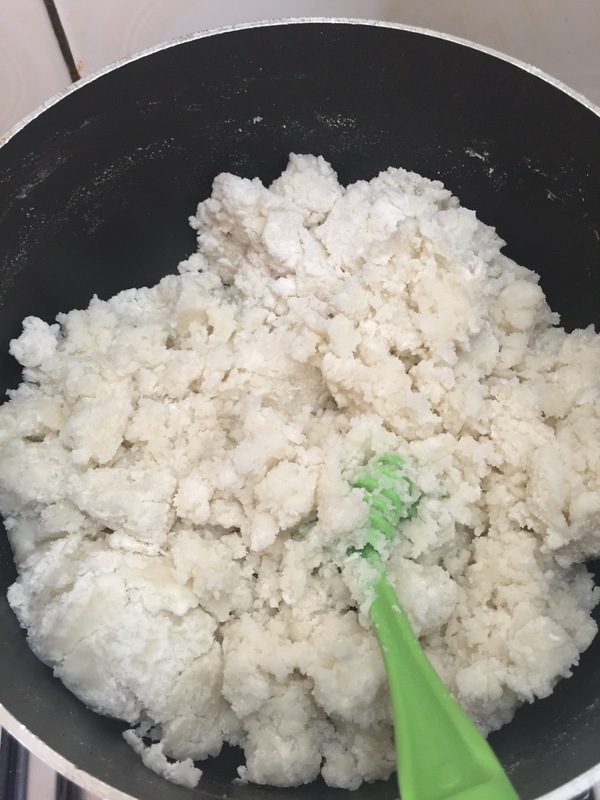 You may use small amounts of milk to make the paste if required while grinding. Make sure you have a smooth paste. Any residual nut bits will make your polis crack open later. 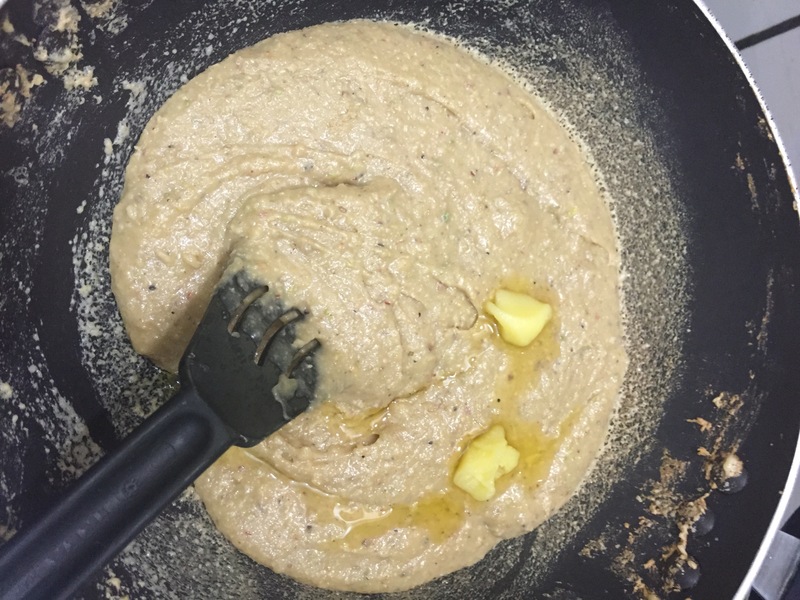 In a non stick pan, heat the castor sugar with a tbsp or 2 of milk and add the nut paste. 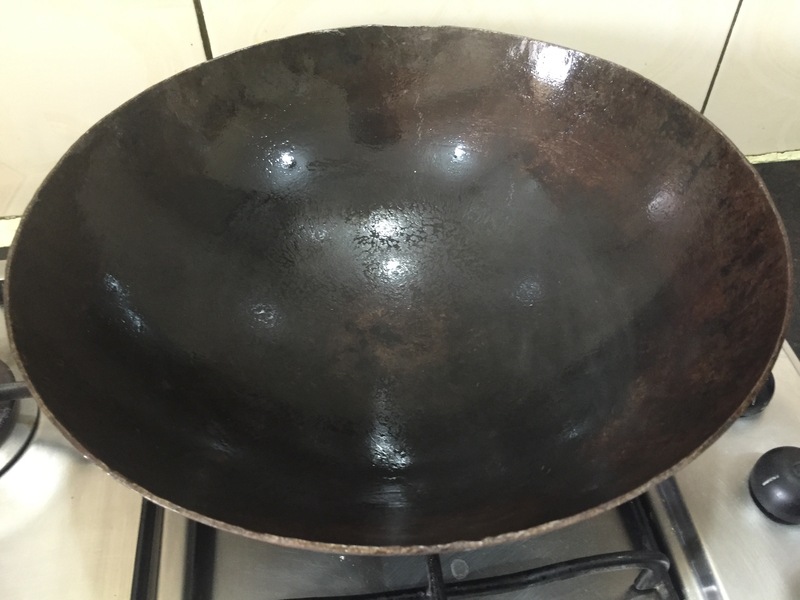 Stir this continuously over a low to medium gas flame for around 20-25 minutes. Towards the end of these 20 minutes, the mixture will start leaving the sides of your pan and the consistency will be nice and sticky. 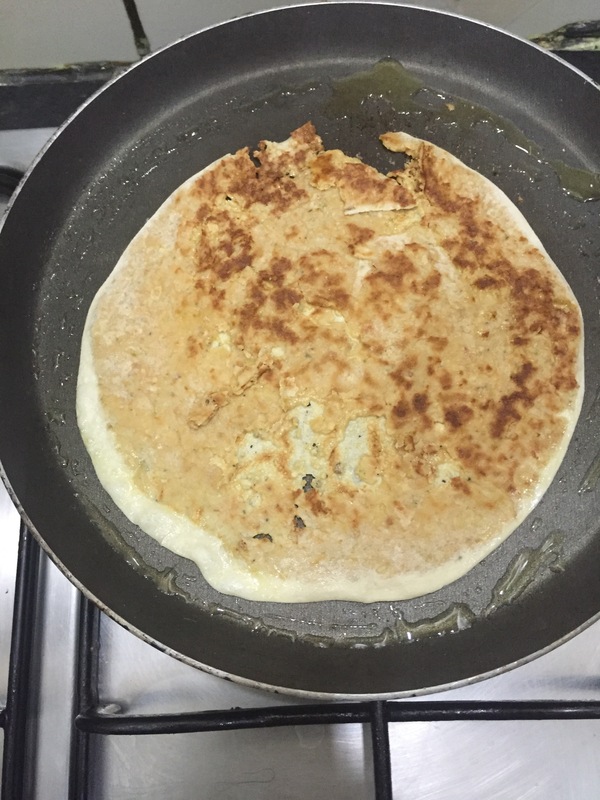 At this point, you know it’s ready… Add the ghee and mix in. 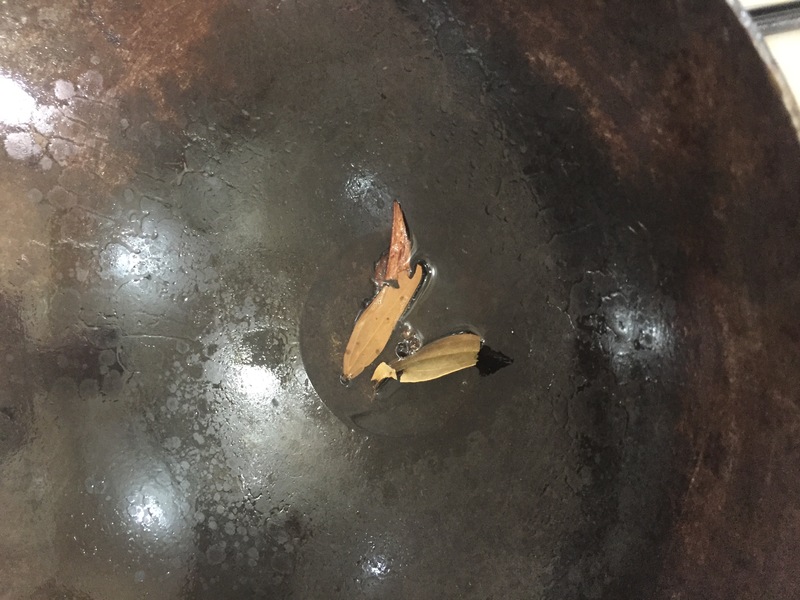 Remove your pan off the flame and cool the mixture. 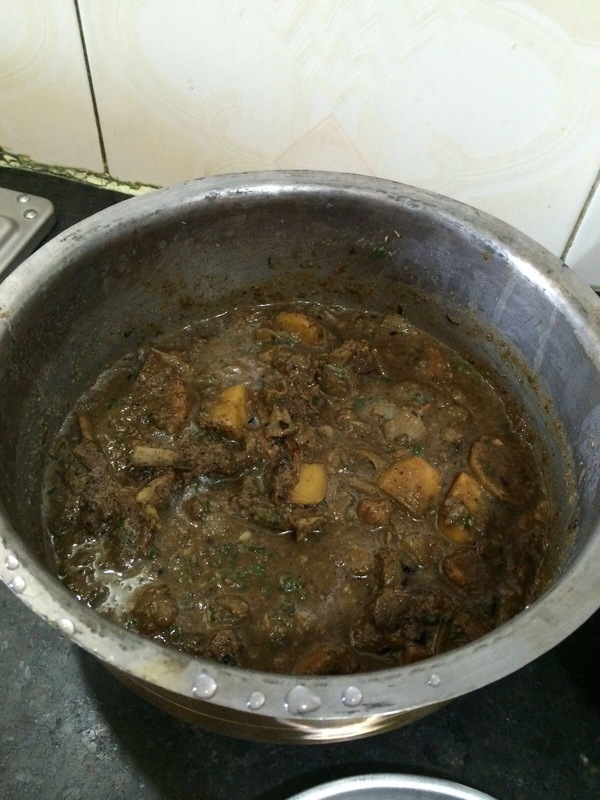 Your halwa is now ready. 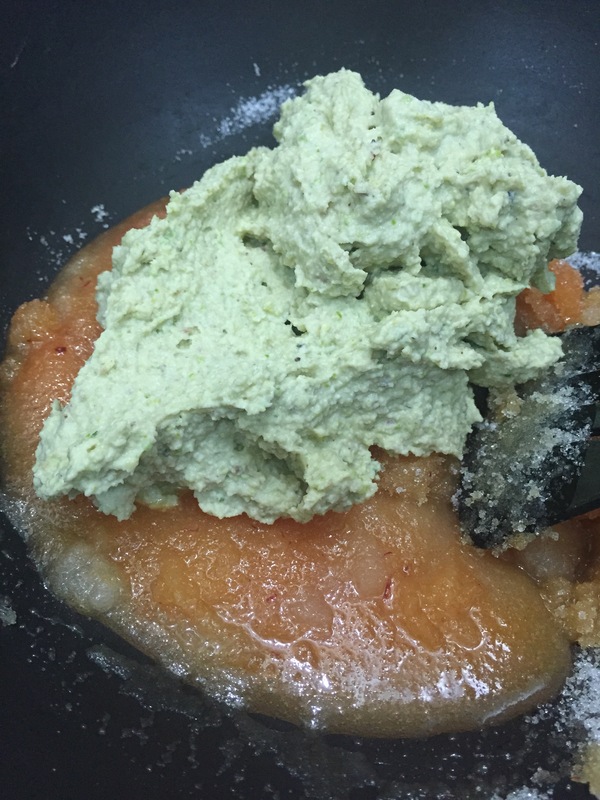 Once it’s cooled, divide the halwa into 20 equal portions and knead well. 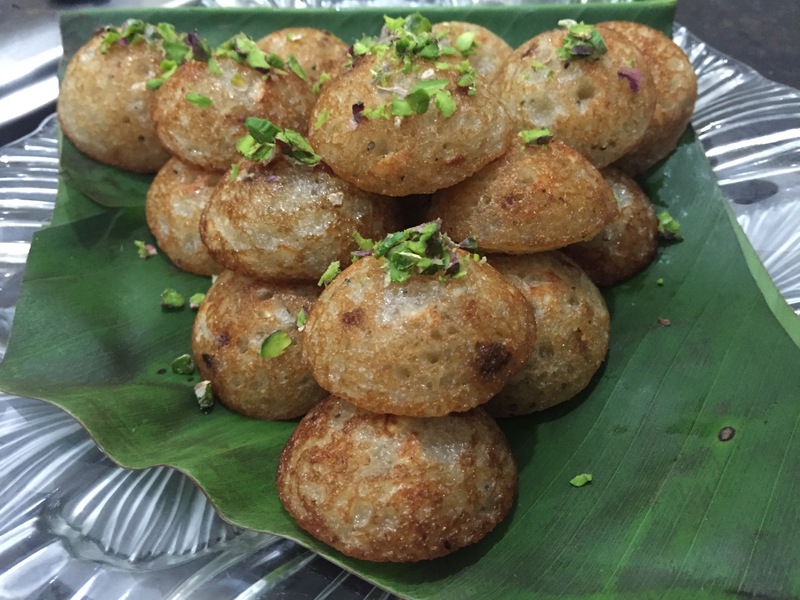 Sieve the maida, add a pinch of salt and knead to a stiff dough (like you would for puris). Knead this well till smooth, add the oil and knead further. You want a smooth pliable elastic dough. Cover this with a damp cloth and set aside for at least one hour. 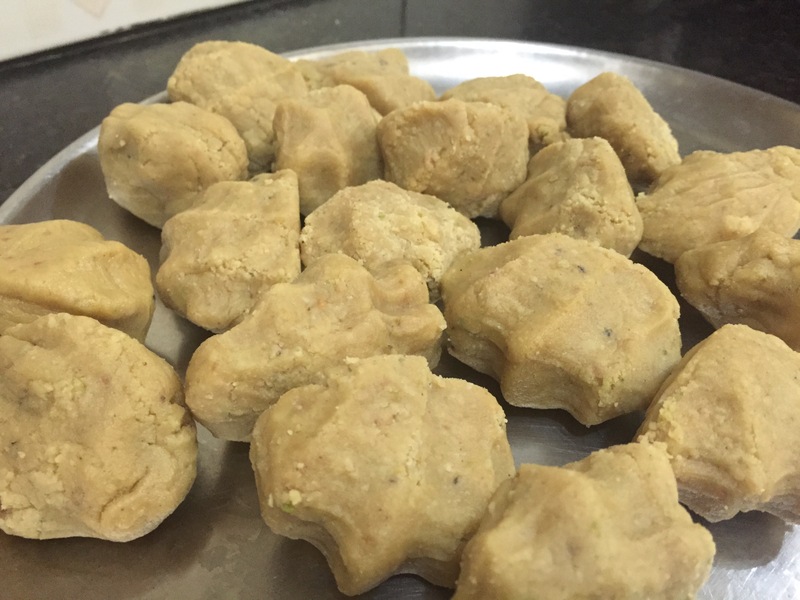 Make 20 even portions of this dough and stuff each of them with the badaam halwa. 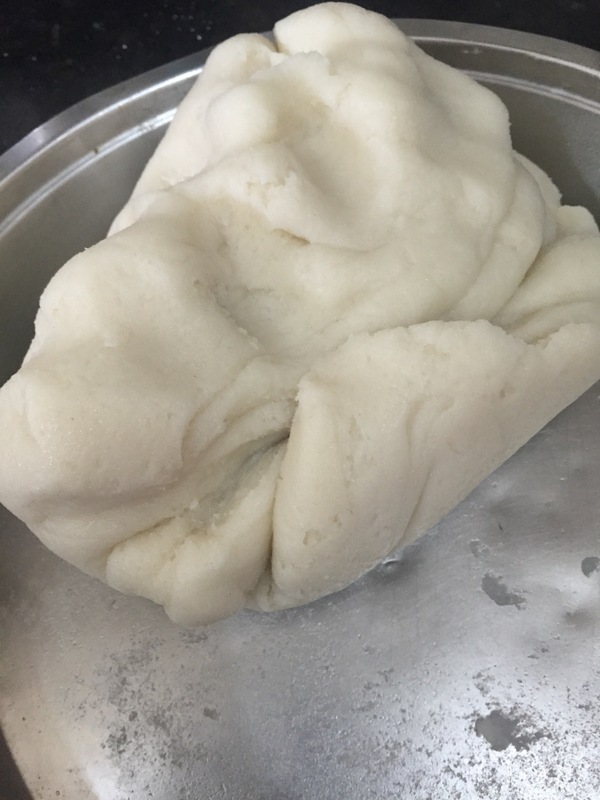 If the halwa is too sticky, dust in a little rice flour before stuffing into your dough. 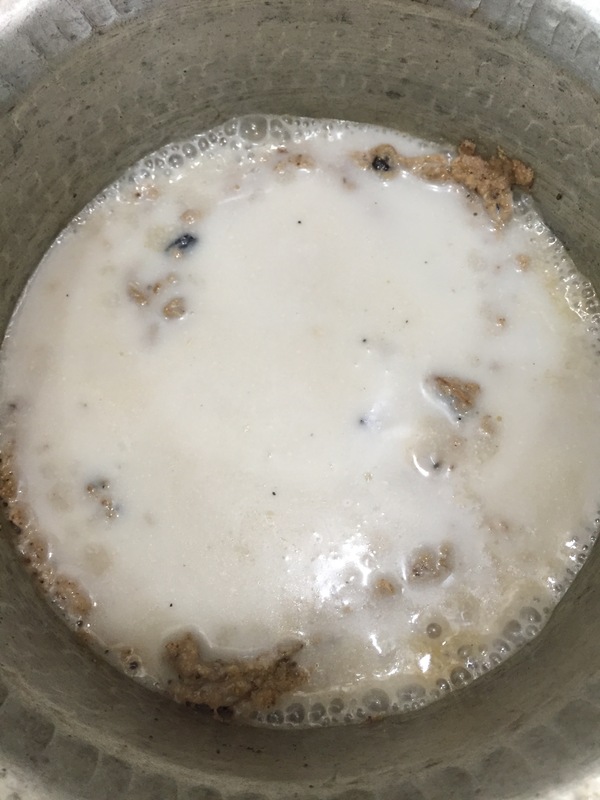 If it’s too dry and stiff dip in a little milk and knead a lil before stuffing. 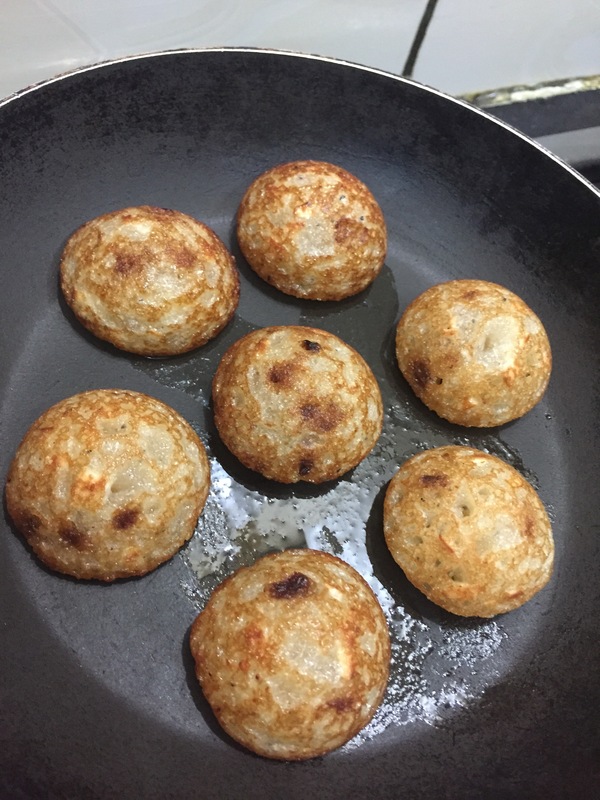 Roll these out like you would a puranpoli or a stuffed paratha, using some rice flour/ maida for dusting. 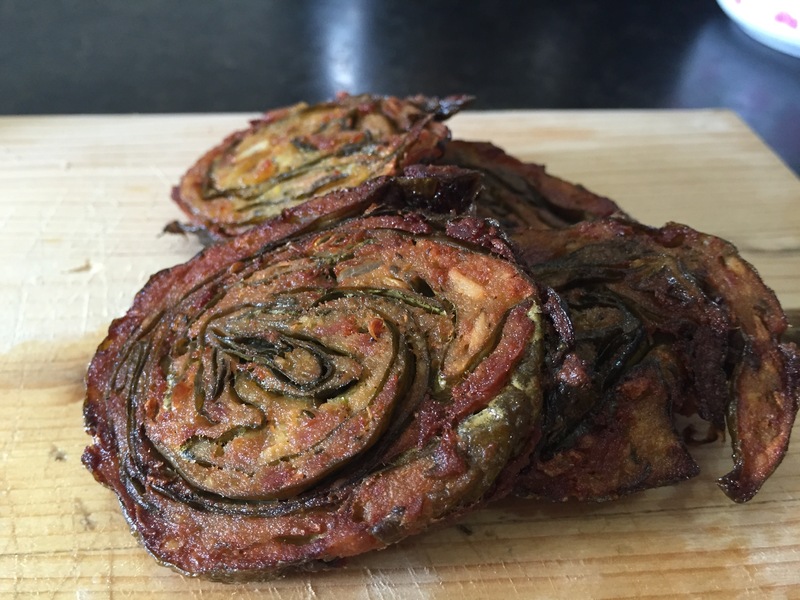 Roast over a slow flame and drizzle with a little ghee. This needs to turn out nicely crisp and golden brown. 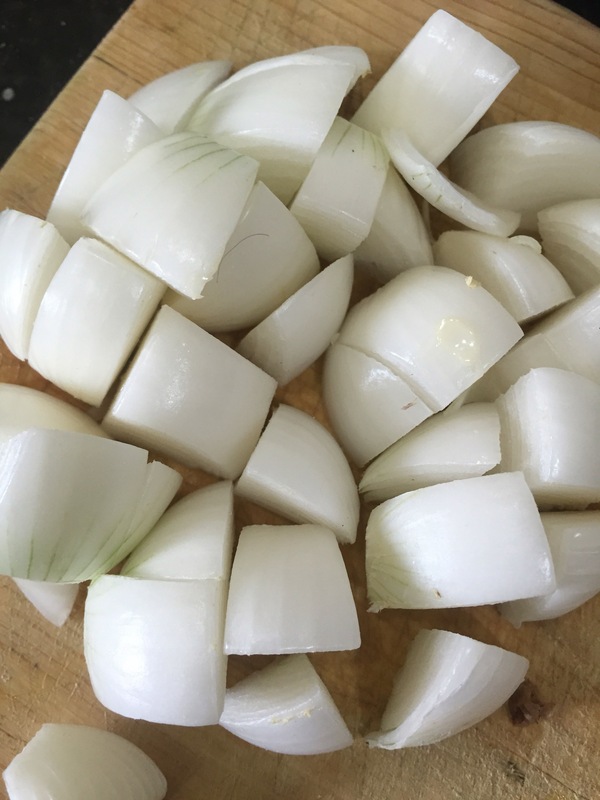 This is a very delicate affair and as you can see in the pictures, not only are they tough to roll out, as you’re roasting them, they have a delicate brittle texture and may break if handled carelessly. If you’re willing to make the effort, I assure you this is by far one of the tastiest sweets you can imagine! 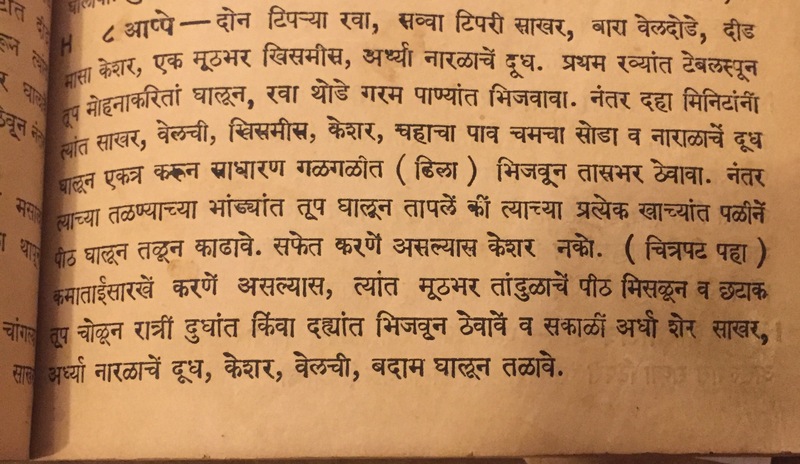 Appe – श्रावणी सोमवारचा नैवेद्य! The Hindu month – Shravan is the advent of the festival season. 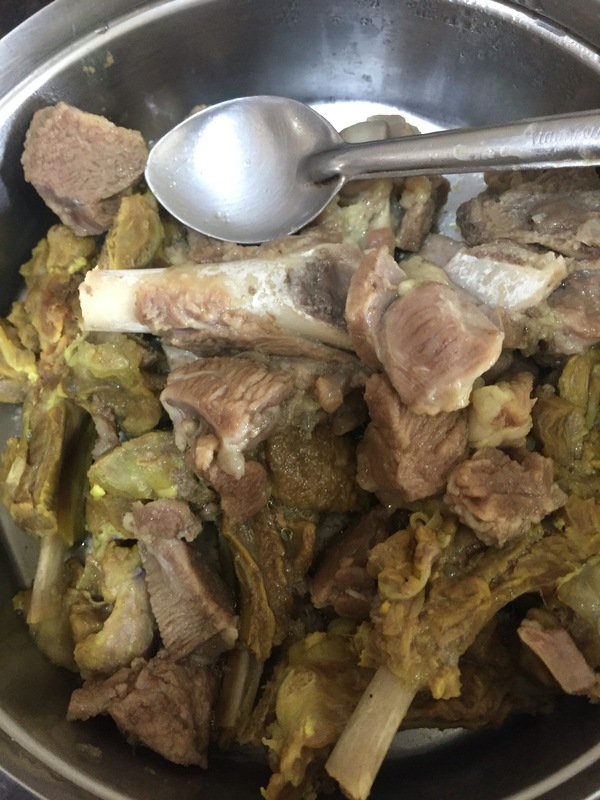 Most Hindus abstain from non-veg food and alcohol during this month. Most PP families don’t abstain throughout the month, but instead choose to fast and stay vegetarian on specific days. 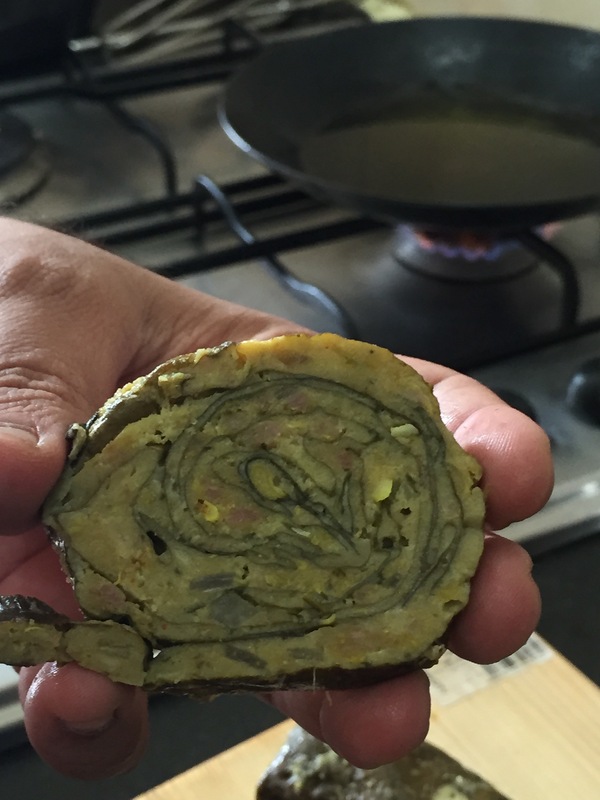 This festive dinner is incomplete without a sweet element in the meal (traditionally laid out in a banana leaf). 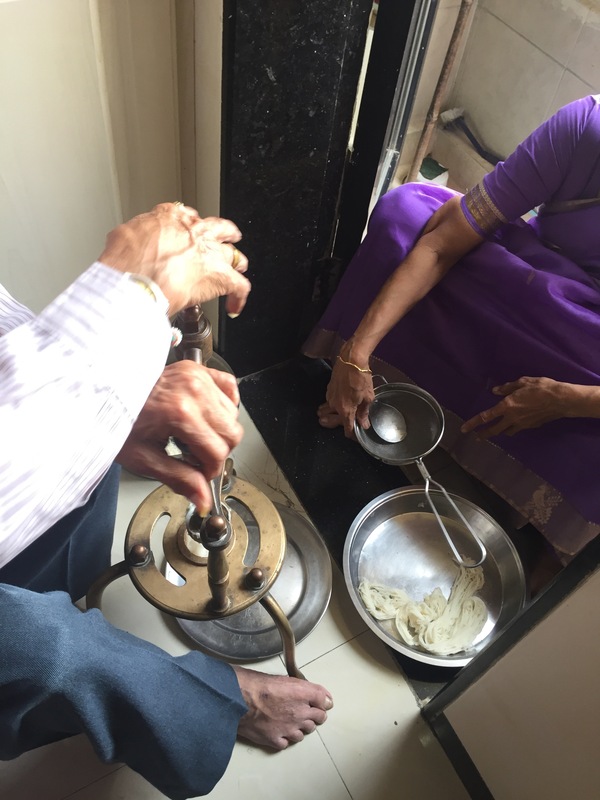 Most traditional families make a different sweet every single Monday in Shravan. 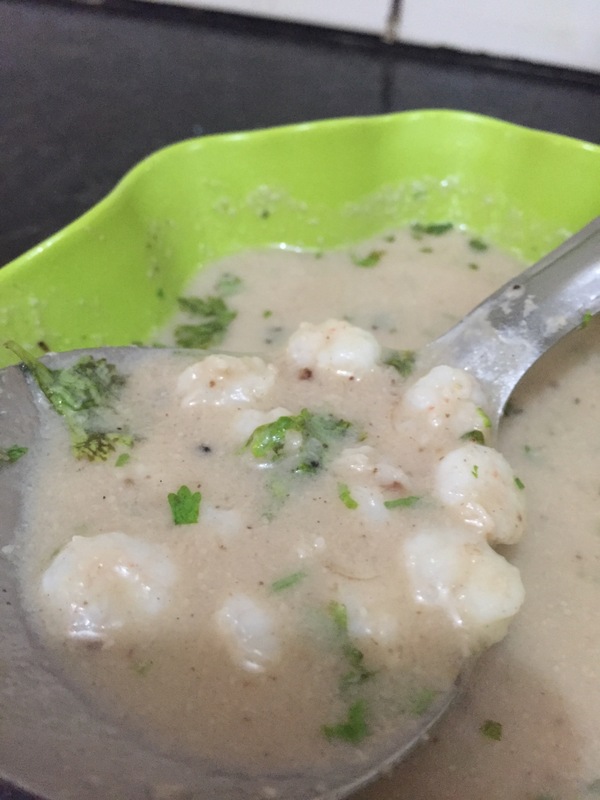 This particular recipe is special to me as it was something my dear late grandmother would cook for the family on श्रावणी सोमवार..
Today is the first time I’ve attempted this recipe since she passed away 15 years ago! 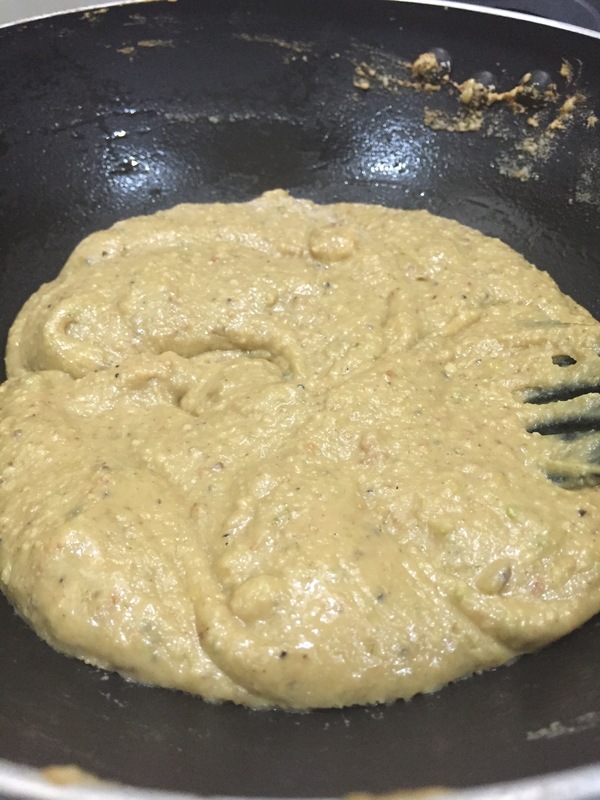 Mix the Rawa and coconut milk to get a pakora like batter. 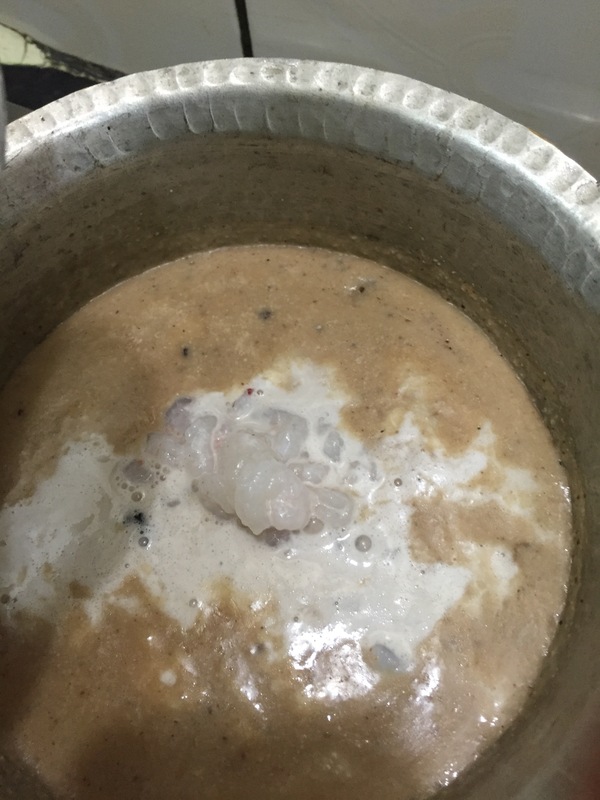 Soak the Rawa in coconut milk for at least one hour. Mix in the sugar, cardamom and nuts and soak for a further hour. 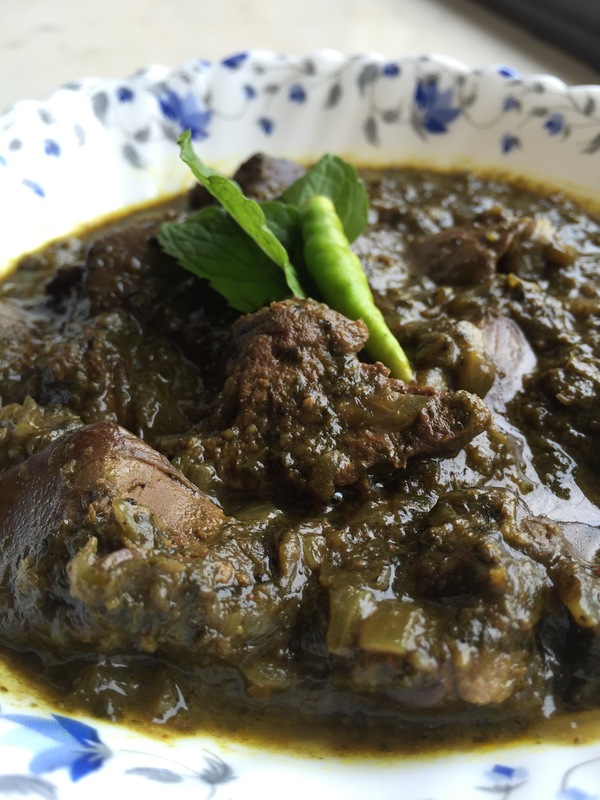 Heat the Appepatra on a medium heat and add a few drops of ghee in each depression. Pour in spoonfuls of batter in each depression and cook on a slow flame till golden on one side. 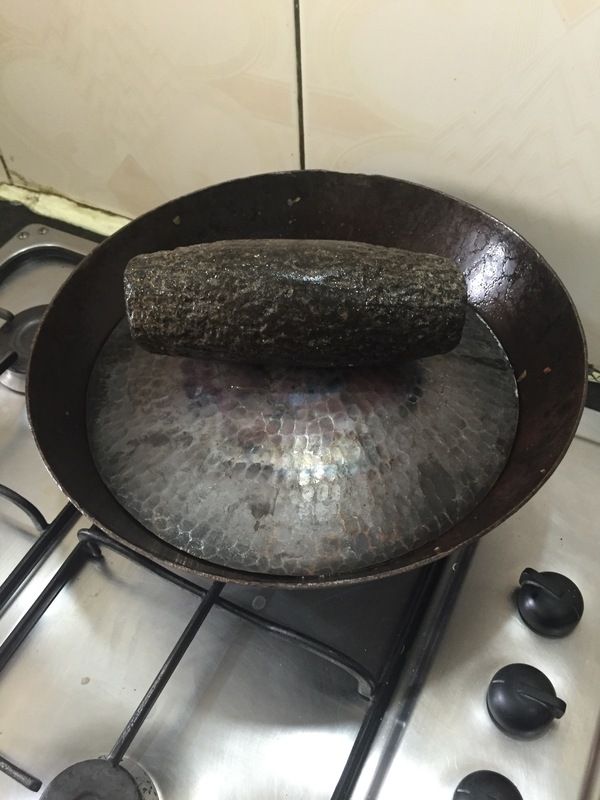 Once it’s cooked, lift it off the pan and crisp on the other side on a flat nonstick Rawa in a little ghee. Serve once cooled – garnished with some pistachios. 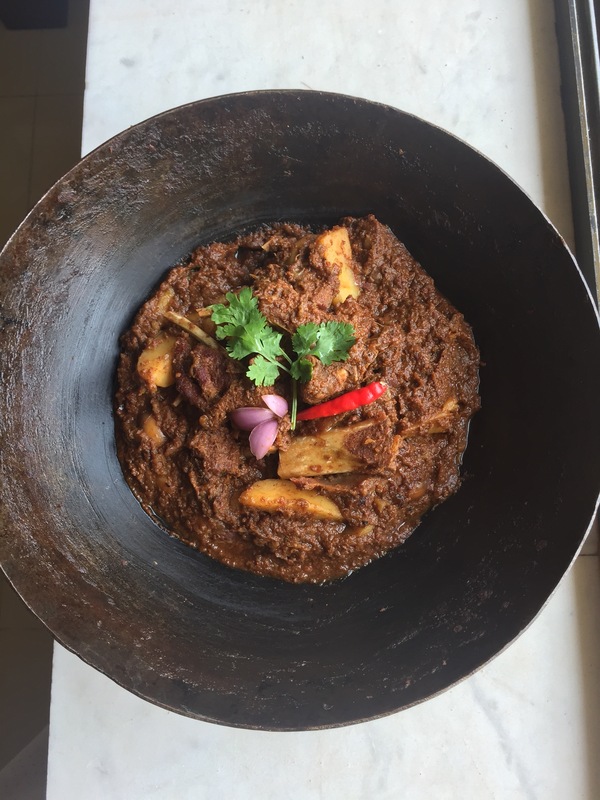 This is my adaptation of a Parbhi recipe which is more often than not prepared using bombil… I’ve replaced the bombil with karandi and made a few tweaks to my Mum and Aaji’s recipe… The resultant curry is tangy and pairs perfectly with steaming white rice and simple fried fish on the side. 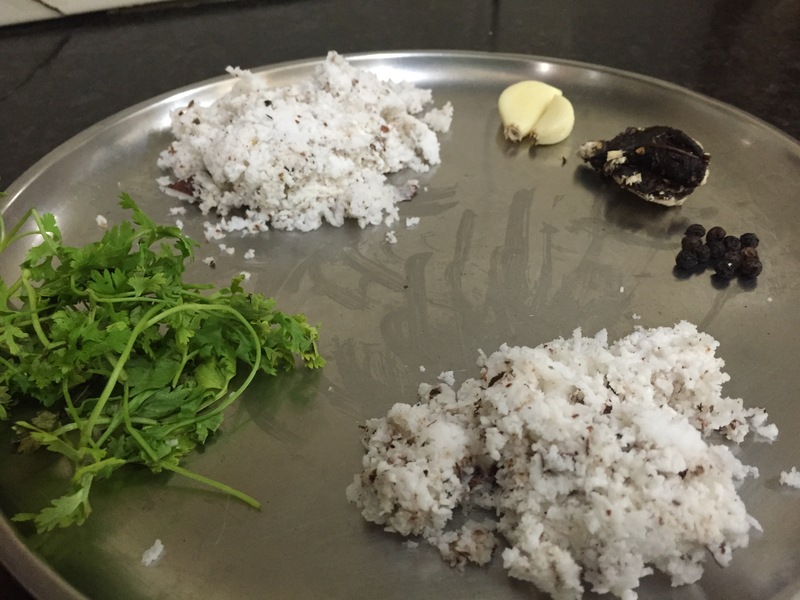 Grind 1/4 cup coconut to a fine chutney like paste along with 2 cloves of garlic, tamarind and peppercorns and salt to taste. 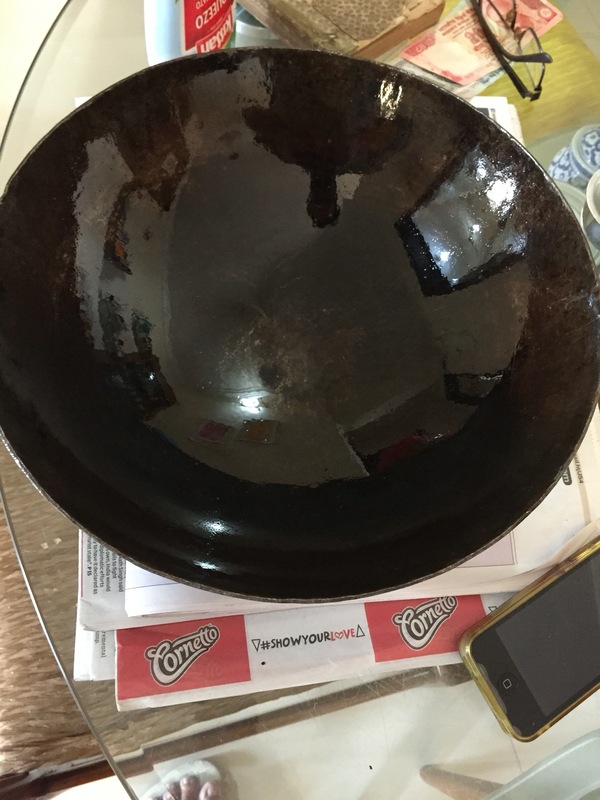 Add a tsp or so of water if required. 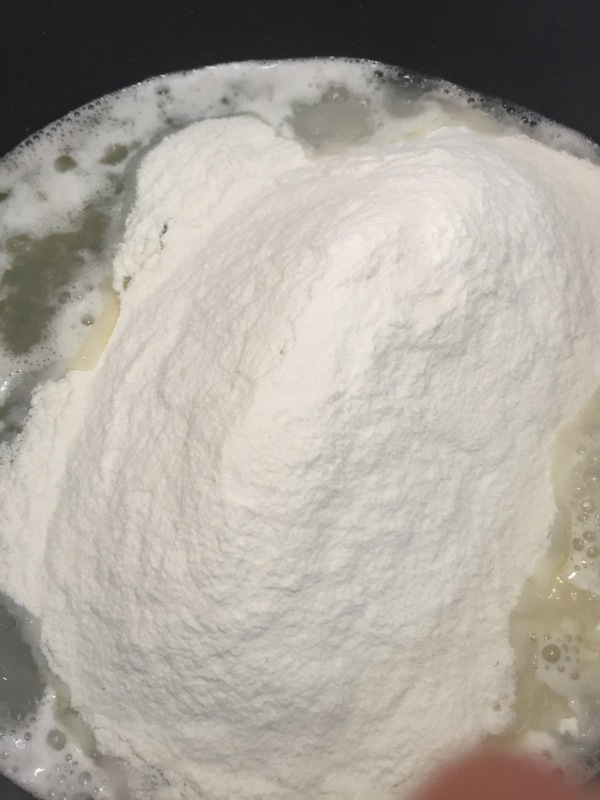 Use 3/4 cup coconut to obtain thick and thin extracts (coconut milk) – blend the coconut first with 1/4th cup water and squeeze out the juice… Strain and set aside – this is the thick extract. 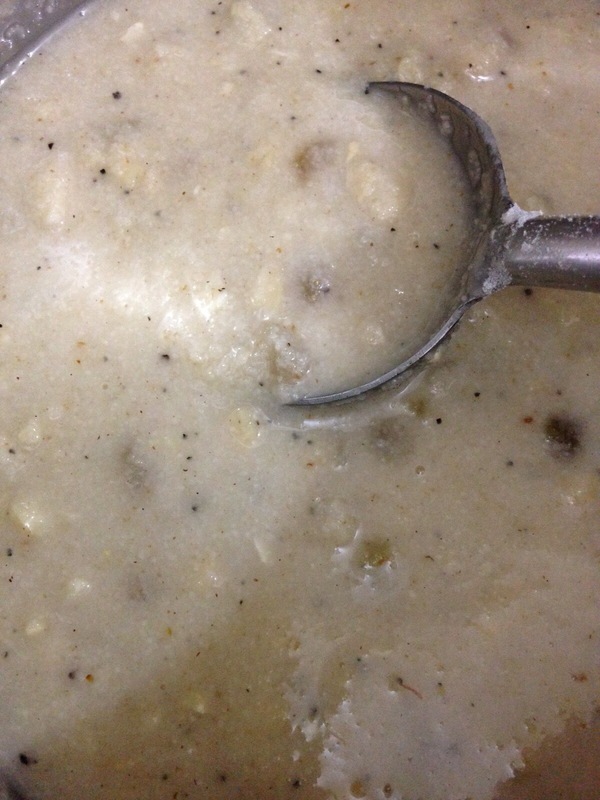 Add 3/4 cup water and repeat this process to obtain thin extract. 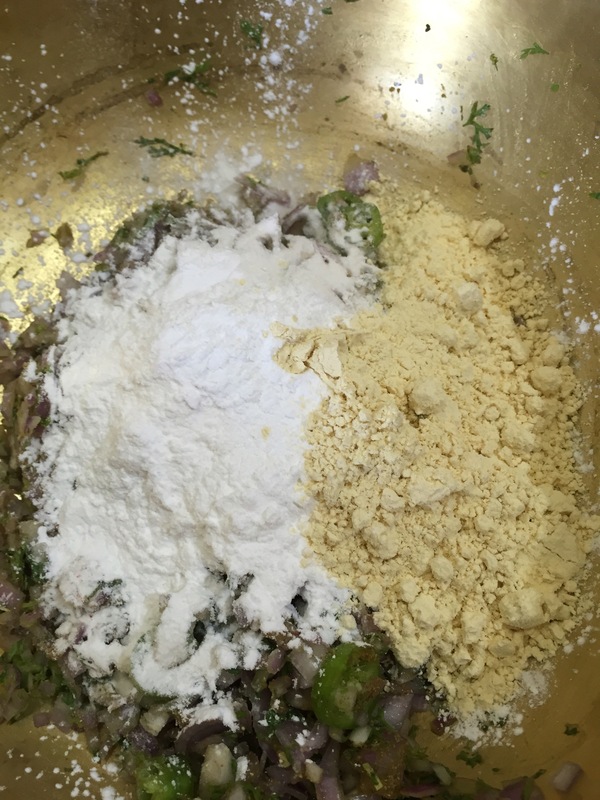 While blending this time around, add the rice / rice flour… Squeeze and strain. 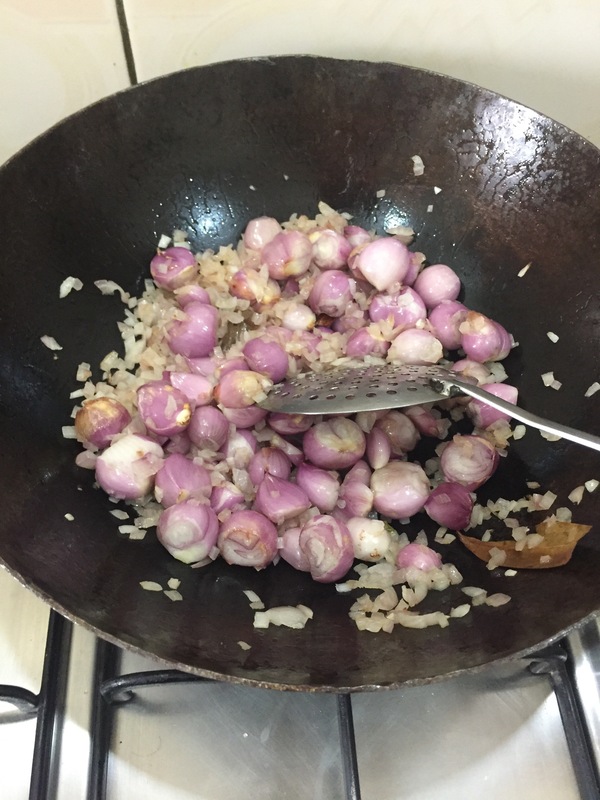 In a thick bottomed pan, heat 1/2 tsp oil, add hing and a crushed garlic clove. 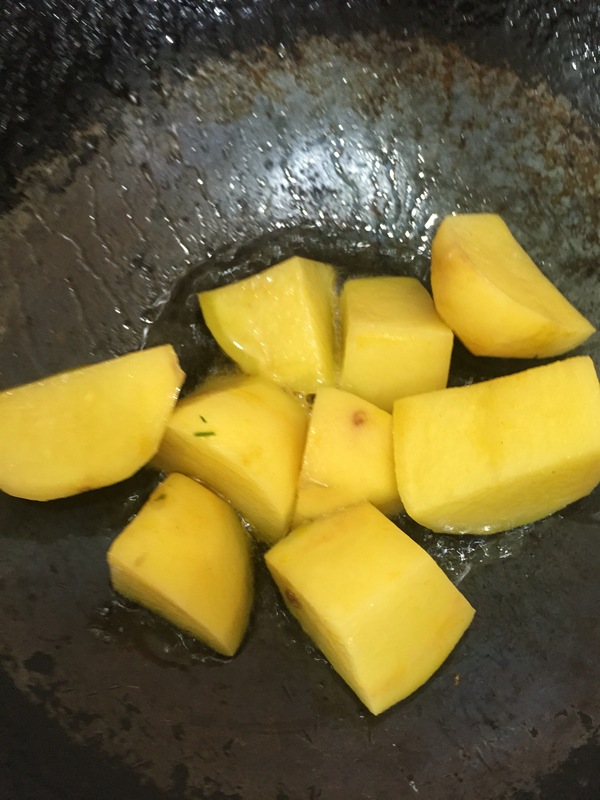 Sauté till golden. 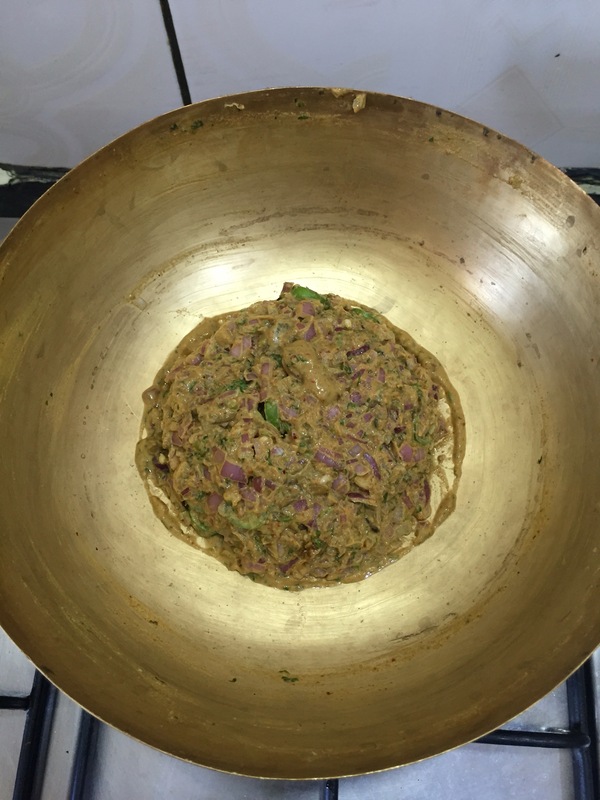 Add the ground coconut paste and sauté for a minute. 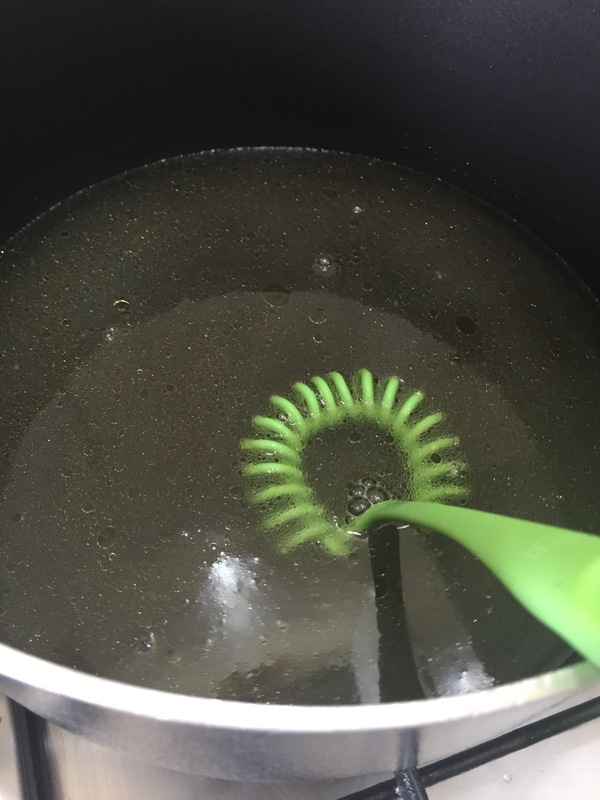 Add the thin extract and bring to a boil. Add the prawns and reduce the heat to a gentle simmer. The prawns should get cooked in a minute or so. 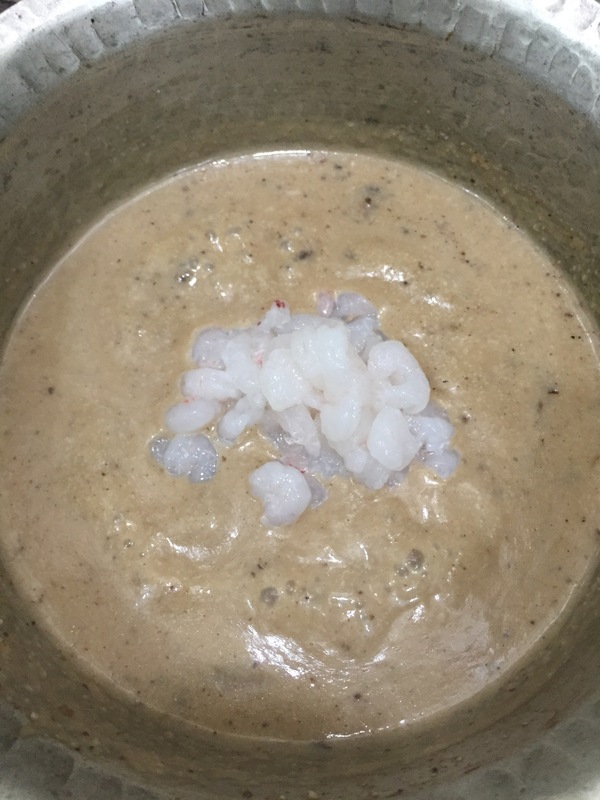 Once the prawns are cooked, add the thick extract and simmer further for 3/4 minutes. 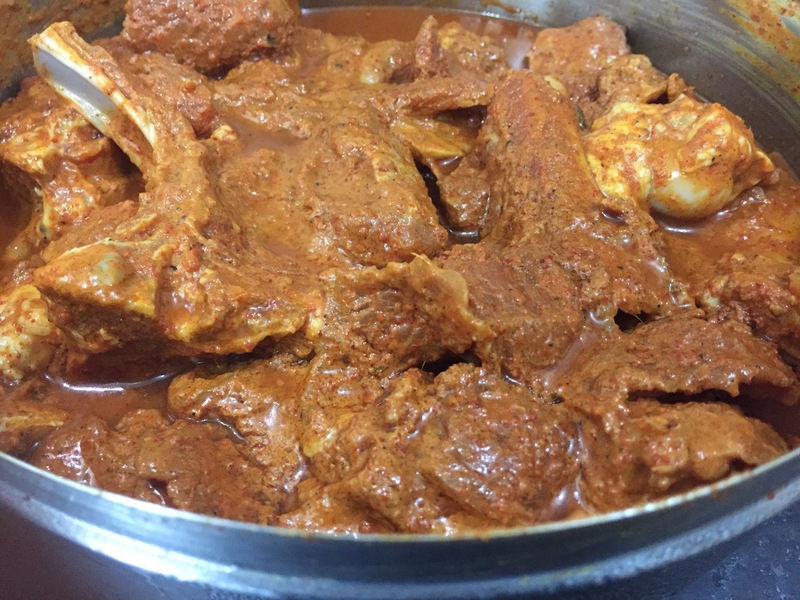 Once the thick extract is added, keep the heat gentle and do not allow the curry to come to a boil. 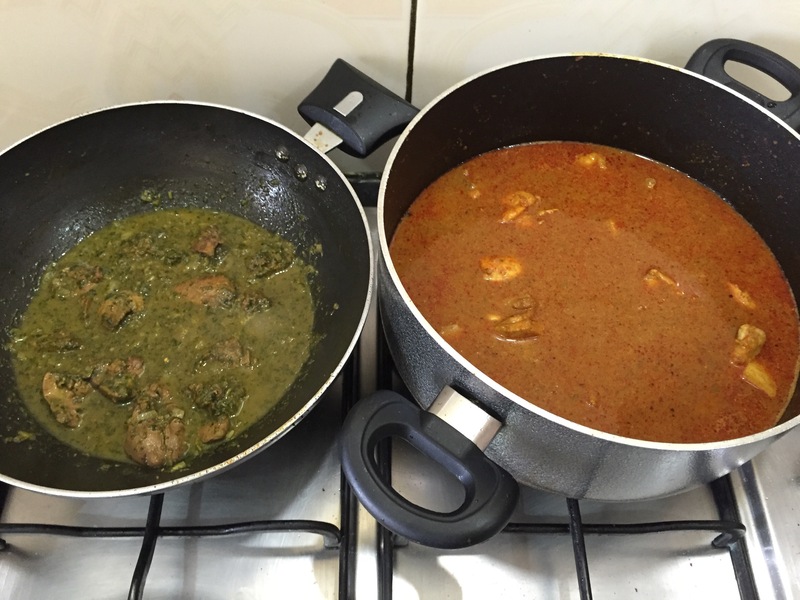 Add the chopped coriander leaves and serve warm with the steamed white rice and some fried fish alongside. 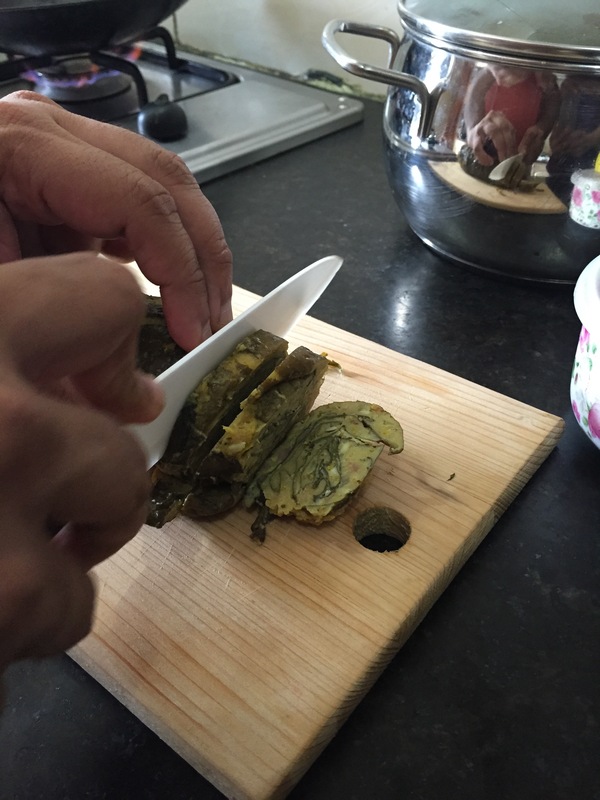 Cut the stalks of the leaves and with a stone/weight, flatten out the veins. 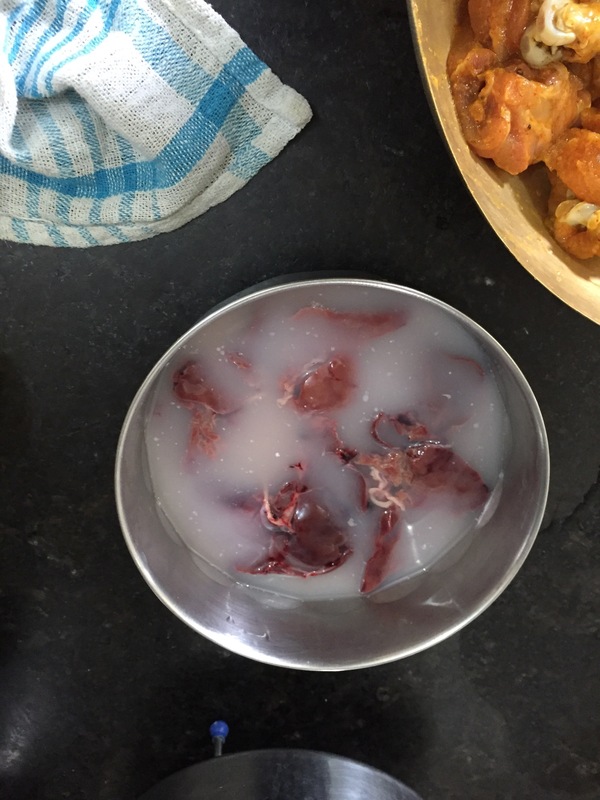 Apply a thin layer of tamarind paste on leaf and spread a generous amount of filling. Steam for around 20-25 minutes till done and cool completely. 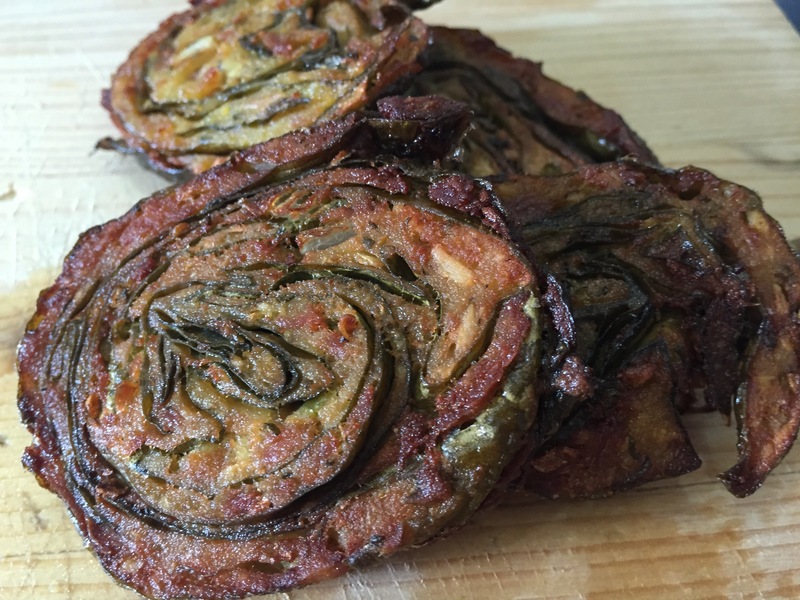 Once cooled, slice into thin roundels and deep fry!